I've got a full post for you all today! 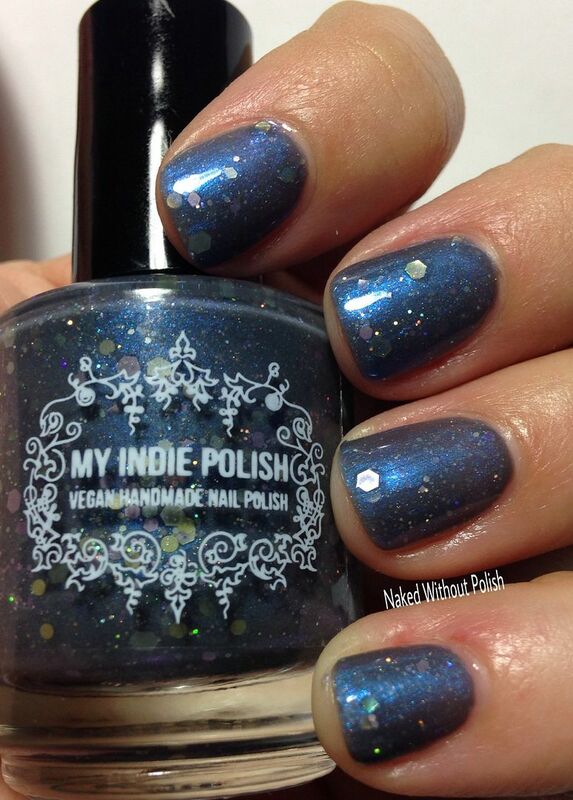 My Indie Polish has released a beautiful twelve piece collection inspired by her hometown of Toronto. She said the collection wasn't supposed to be this big, but she kept finding inspiration and wasn't able to cut anything. When you're that inspired, you shouldn't have to make cuts...in my opinion! She did such a beautiful job! What better name for a collection introducing us to her hometown than the Hello Toronto Collection? We're going to jump right into the collection since there are so many to show off. Keep reading to see more! 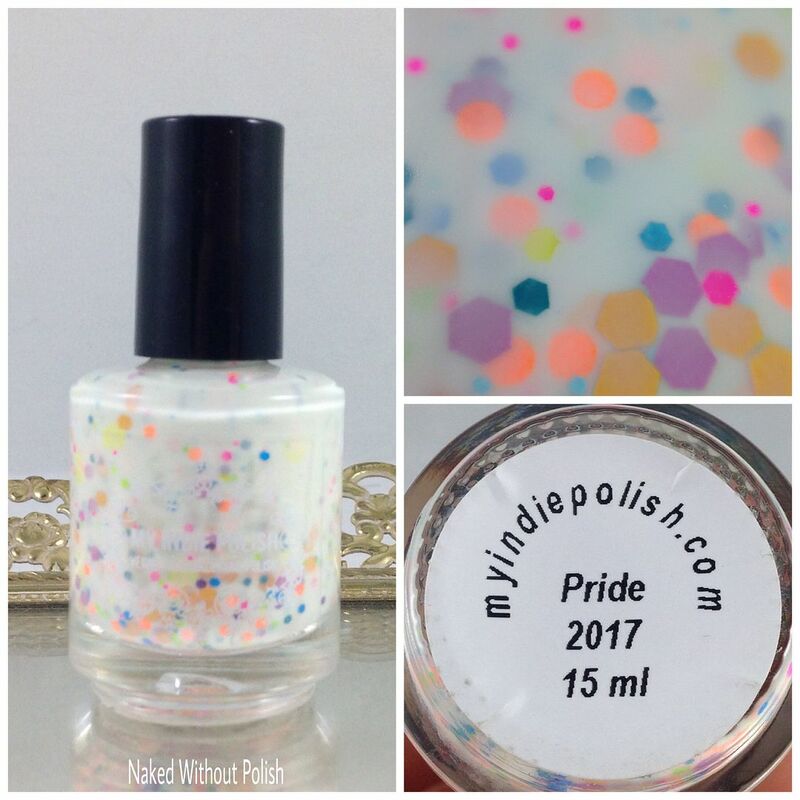 Pride 2017 is described as "a white based crelly with matte glitters in various sizes, shapes, and colors". 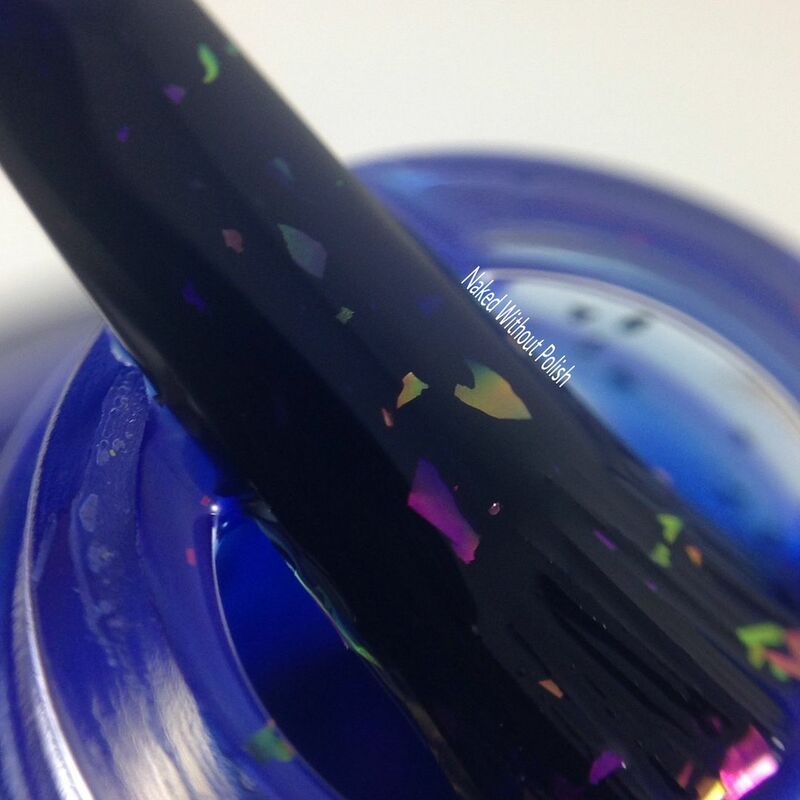 Shown is two coats of Pride 2017 with top coat. 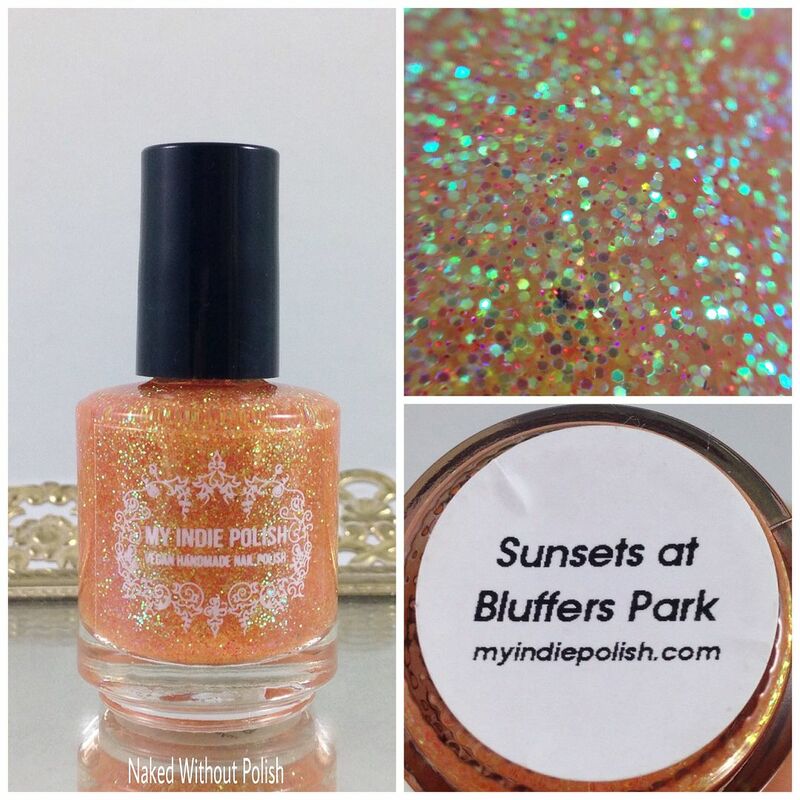 Sunsets at Bluffers Park is described as "a sheer jelly tinted orange filled with green iridescent micro glitter and metallic red macro glitter". 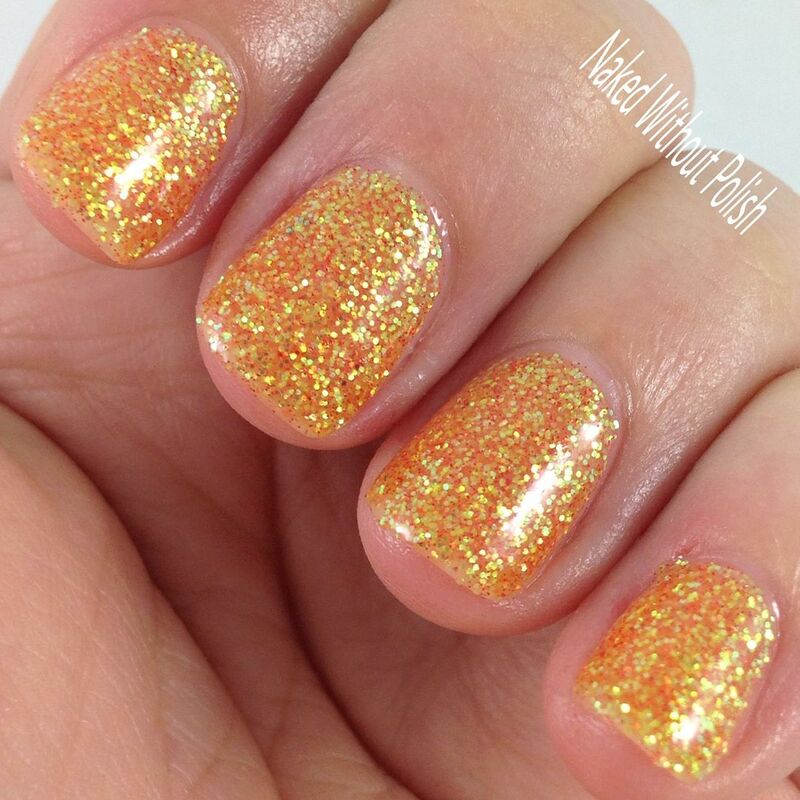 Shown is three coats of Sunsets at Bluffers Park with top coat. Sunsets at Bluffers Park is a little on the thick side, and it comes with a sticker informing you of that. I have a cold house so it was extra thick, I did add a little thinner to make it a bit more workable. It was very easy to work with after that. It is a little sheer. 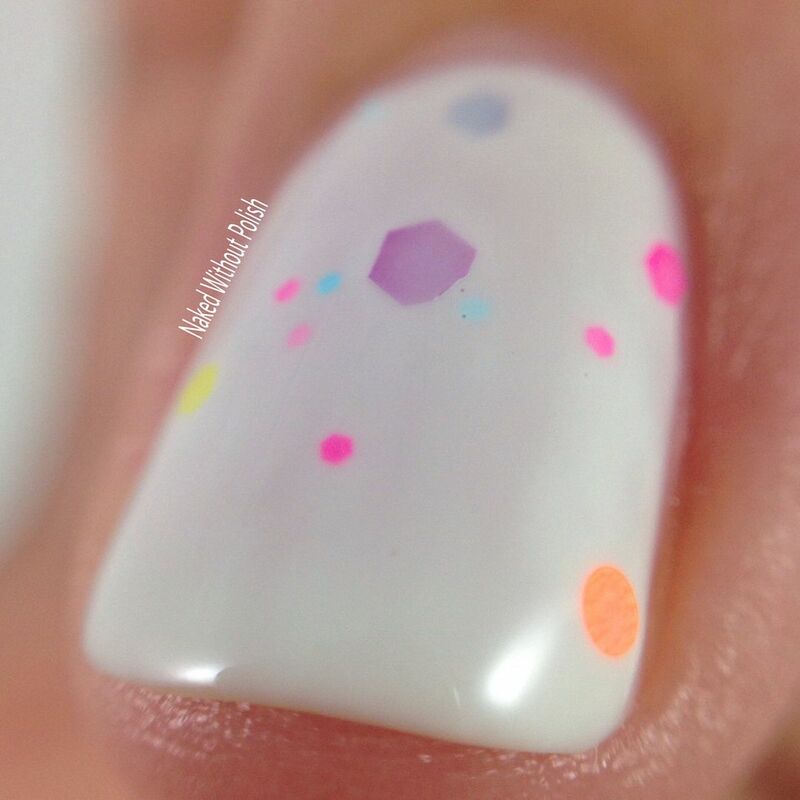 I was able to reach full opacity after three coats. 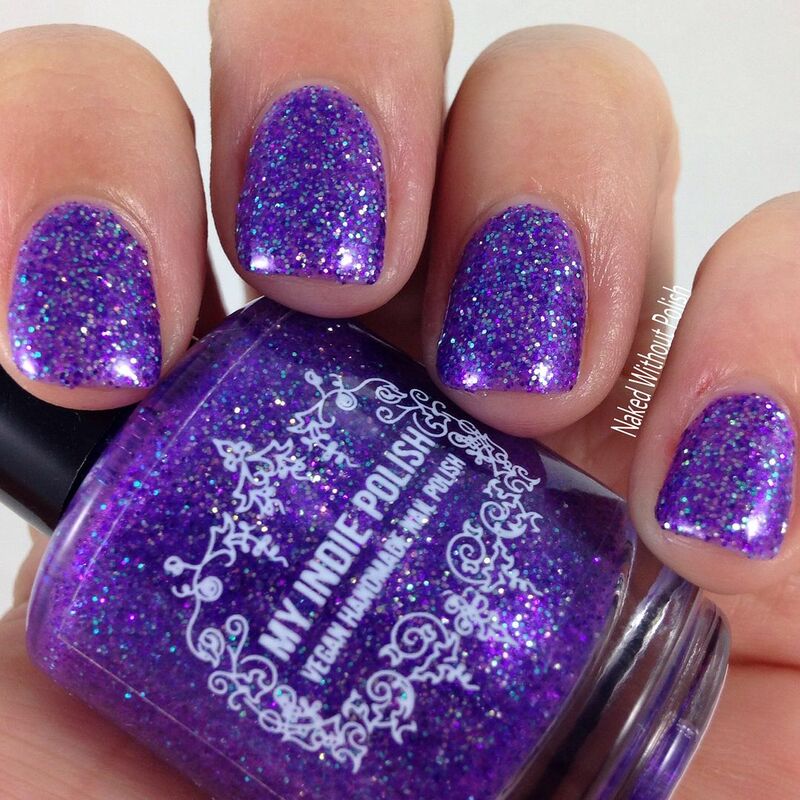 I really like how packed with glitter it is. Yes, it makes it a bit thicker, but it is worth it! 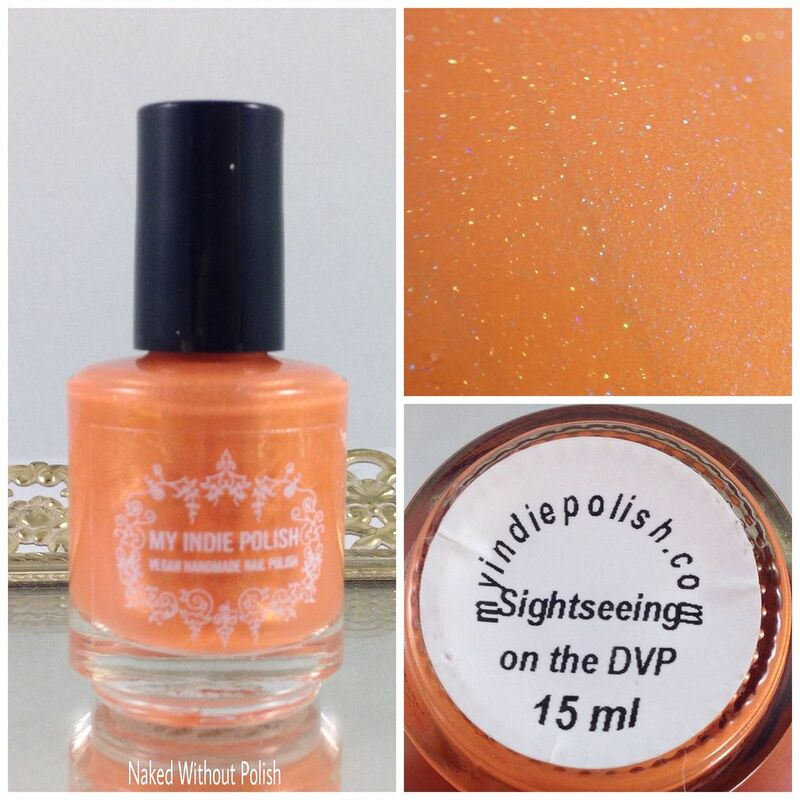 Sightseeing on the DVP is described as "an orange creme with golden shimmer and a dusting of holo sparkle". 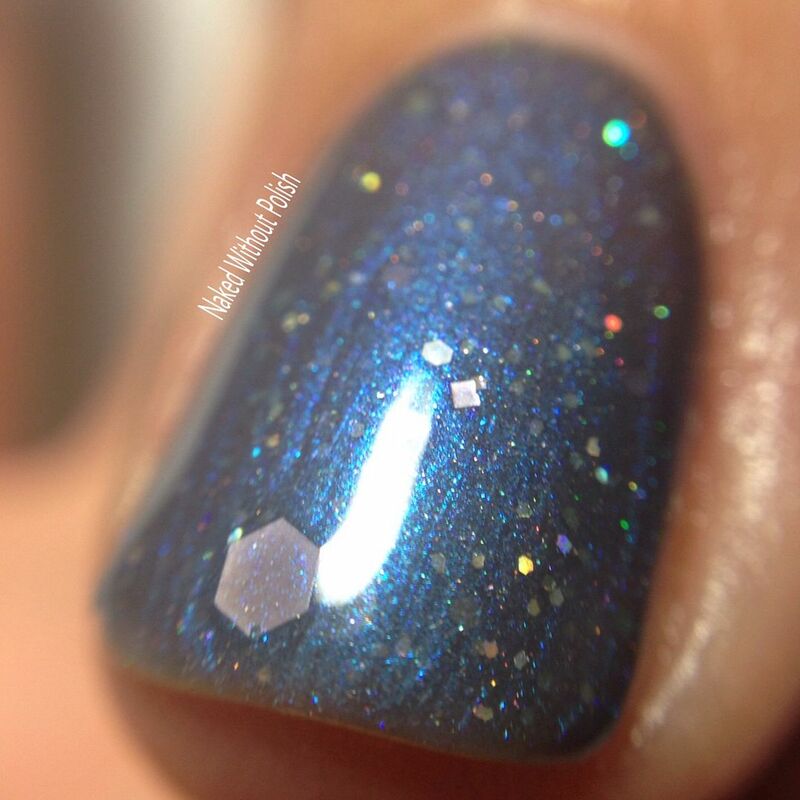 Shown is two coats of Sightseeing on the DVP with top coat. Sightseeing on the DVP was so close to being a one coater. I do thinner coats, so a second coat was needed. 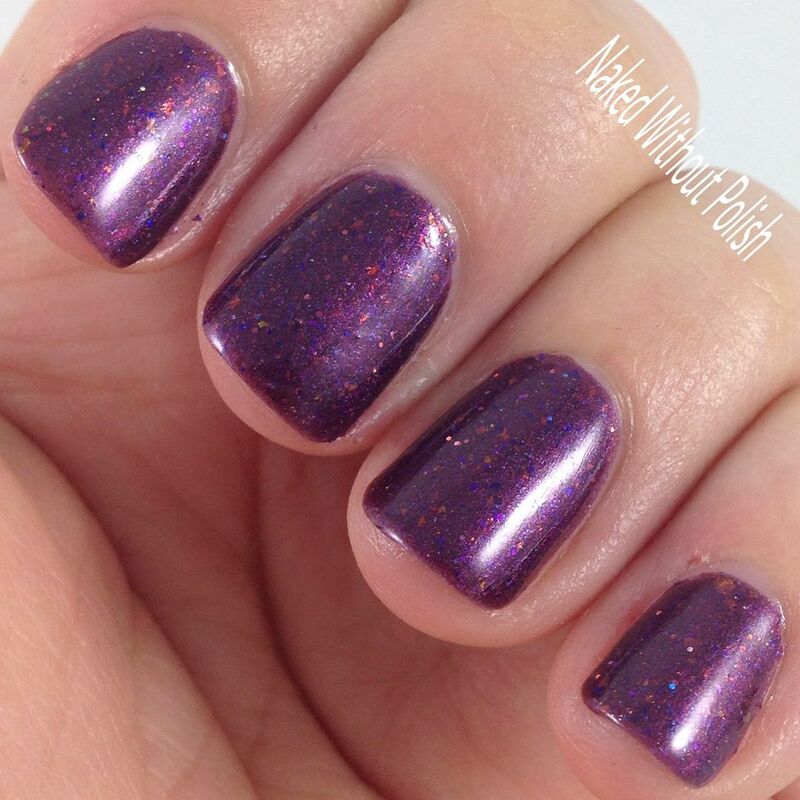 If you do slightly thicker coats of polish, you could probably get away with only doing one coat. This one had a super smooth application. It was a surprise favorite from the collection. 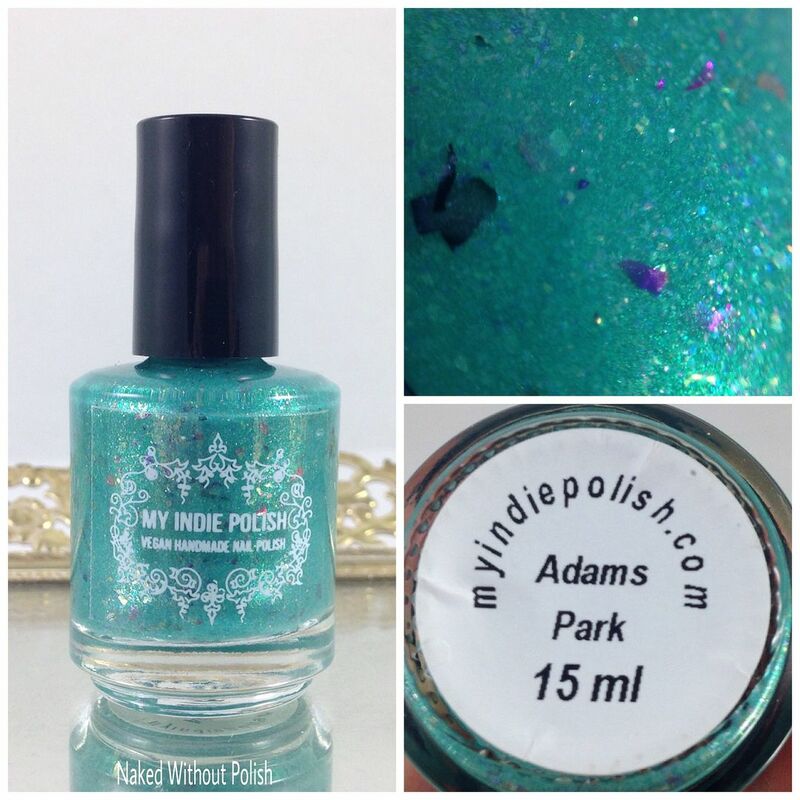 Adams Park is described as "a turquoise leaning teal filled with iridescent flakies and UCC flakes.". 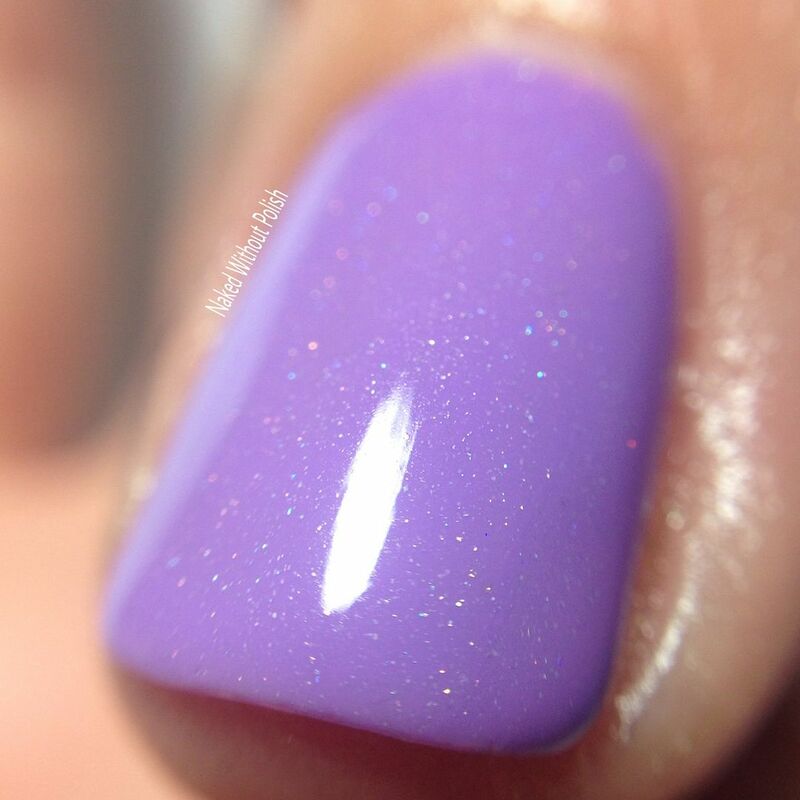 Shown is two coats of Adams Park in light tent. Adams Park is a pool of beauty! 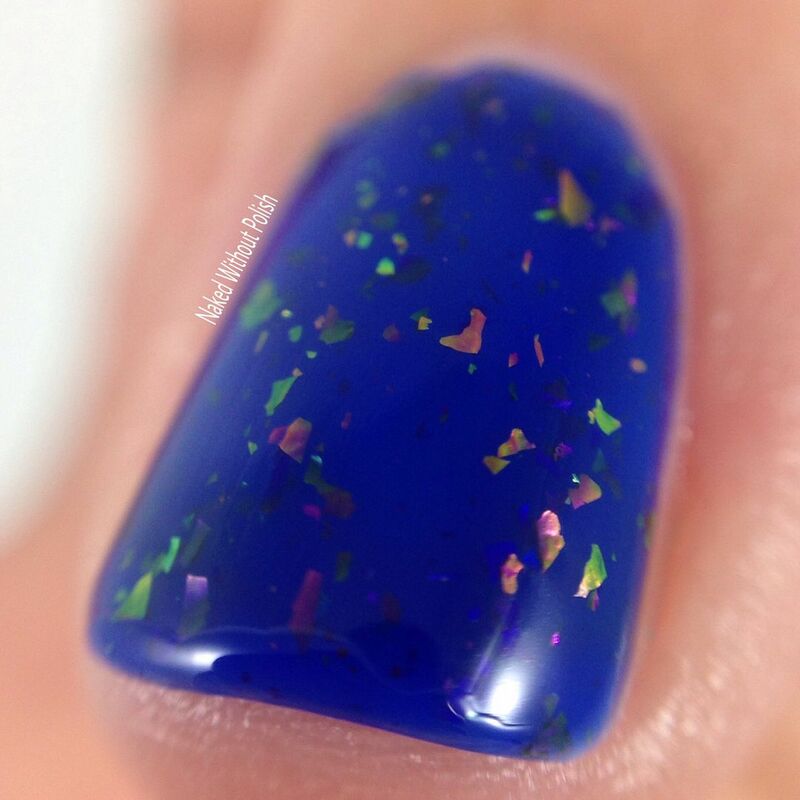 The base color will draw you in, but the dimension that all the flakies create will keep you mesmerized. 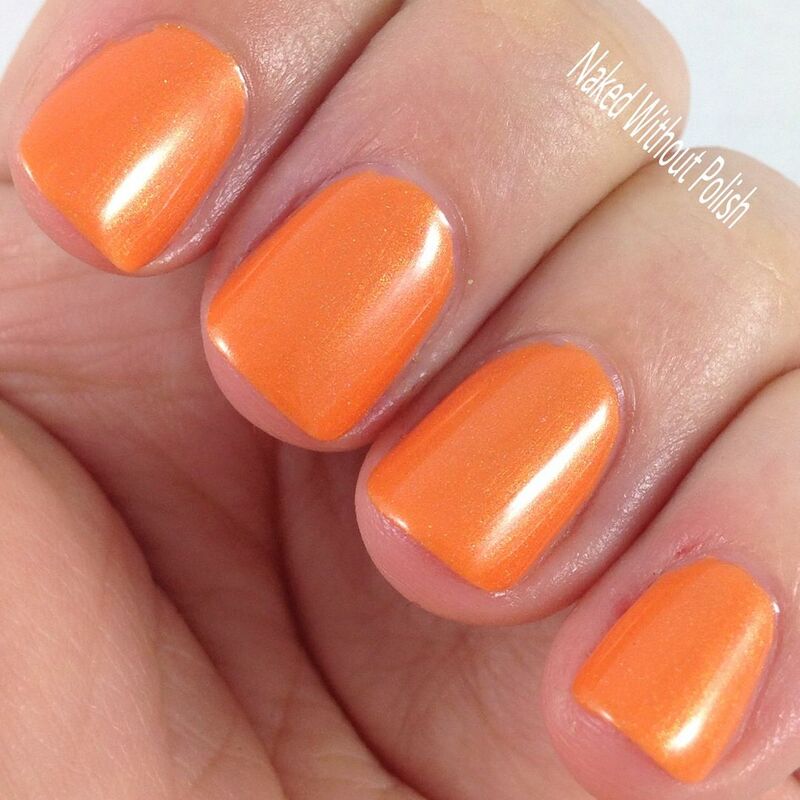 Two coats will give you a fully opaque nail. 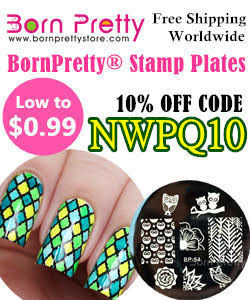 It is definitely begging to have some stamping or nail art done over it. 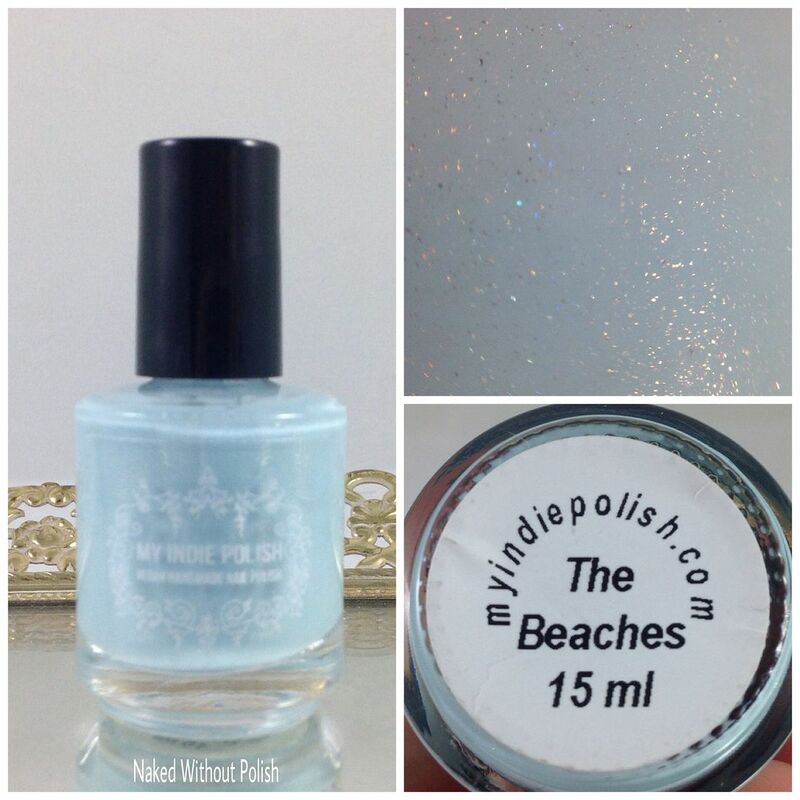 The Beaches is described as "a pale blue crelly with a lovely dusting of holo sparkle". 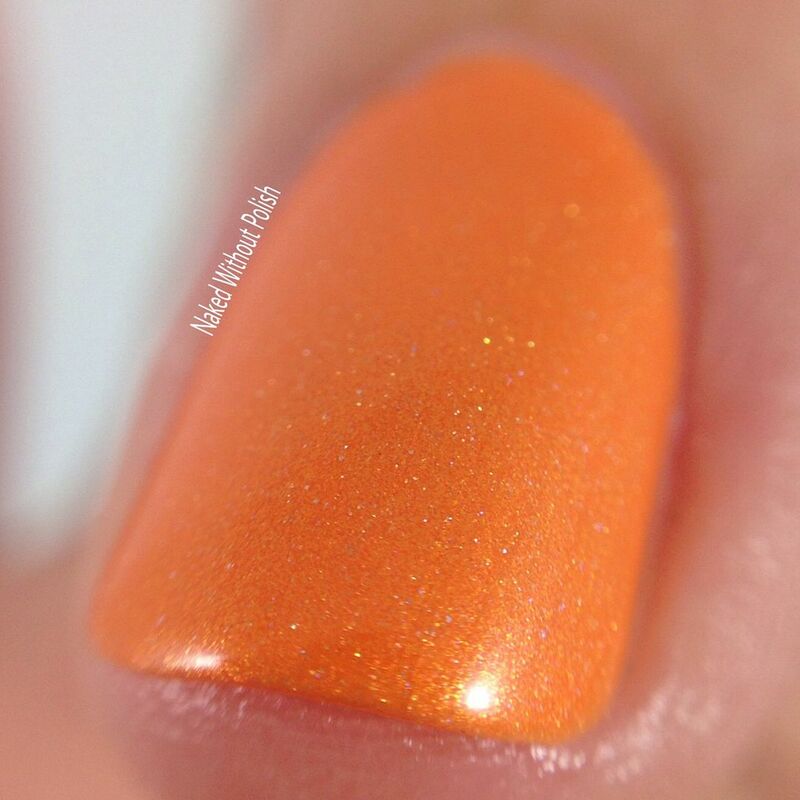 Shown is two coats of The Beaches with top coat. 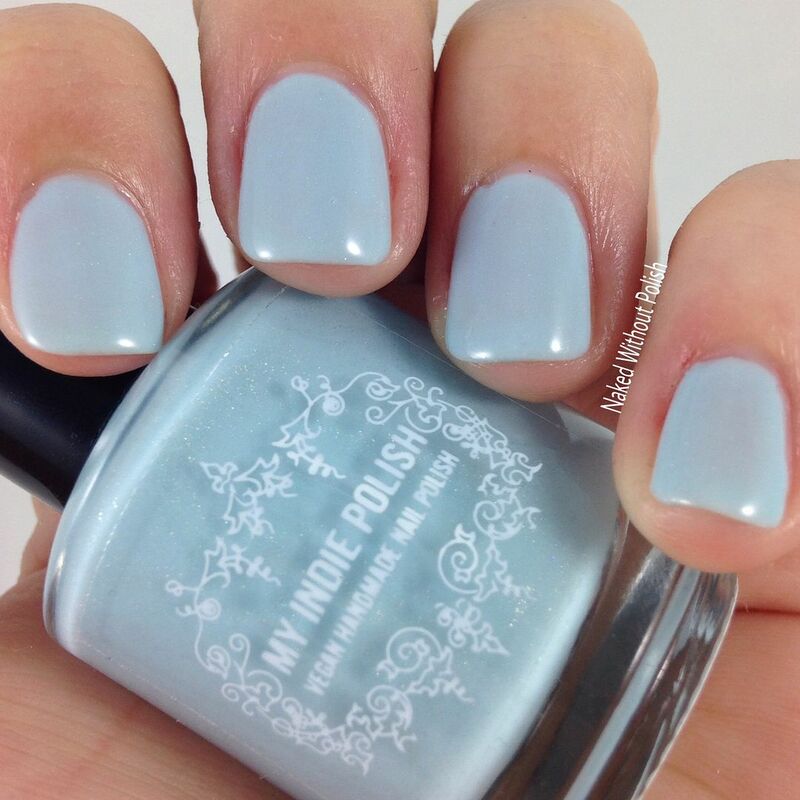 The Beaches is a beautiful, soft blue crelly. 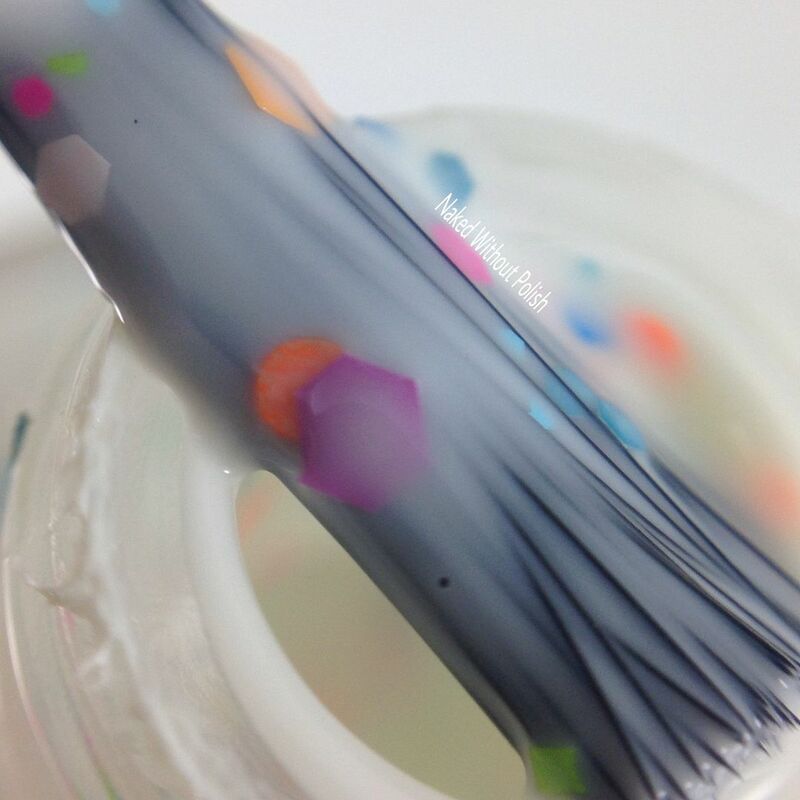 It had a slightly streaky application with the first coat, but after the second coat was applied, it evened out and became fully opaque. 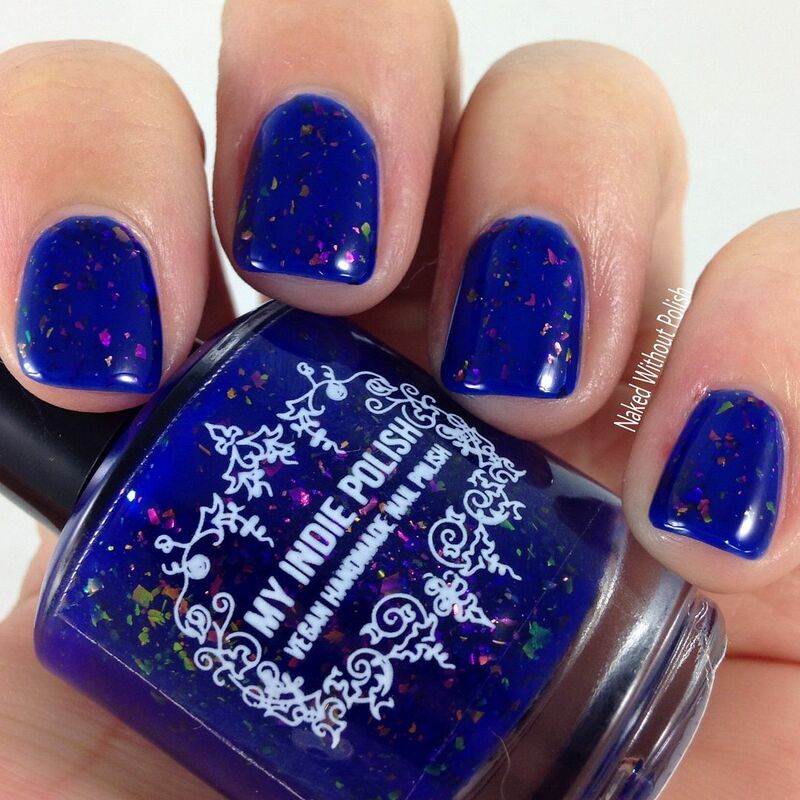 The perfect blue for spring! 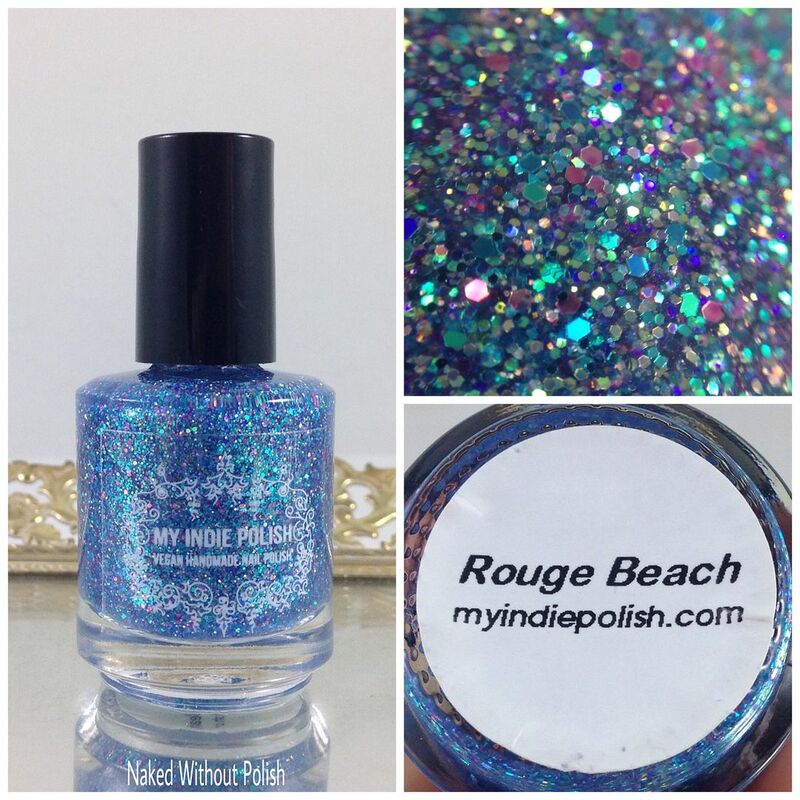 Rouge Beach is described as "a sheer jelly tinted blue filled with small and micro glitter in metallic teal, turquoise, blue, and purple, as well as iridescent micro glitter". 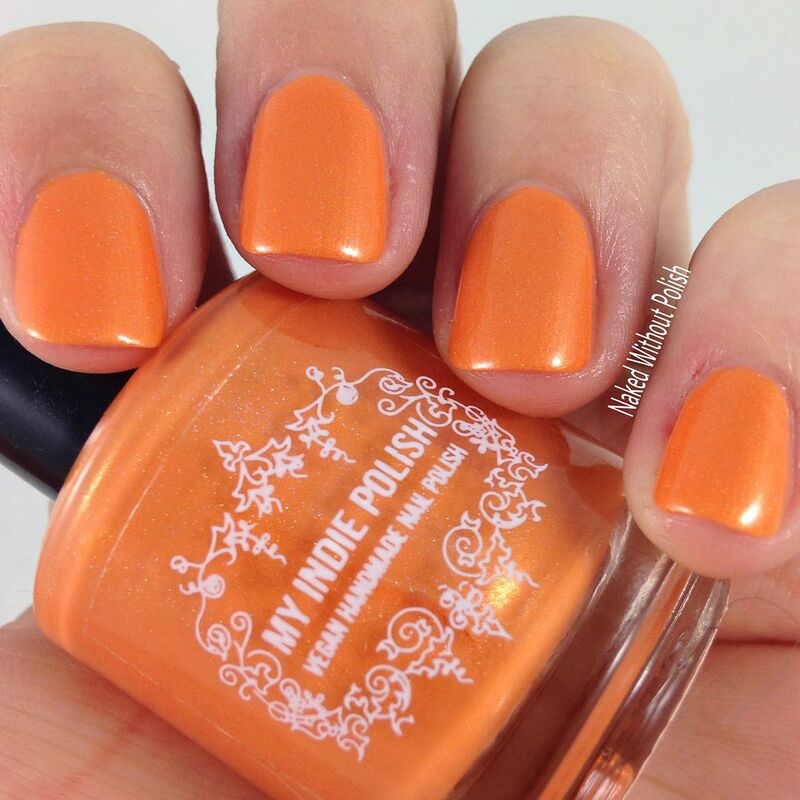 Shown is three coats of Rouge Beach with top coat. Rouge Beach is pretty much the blue version of Sunsets at Bluffers Park. 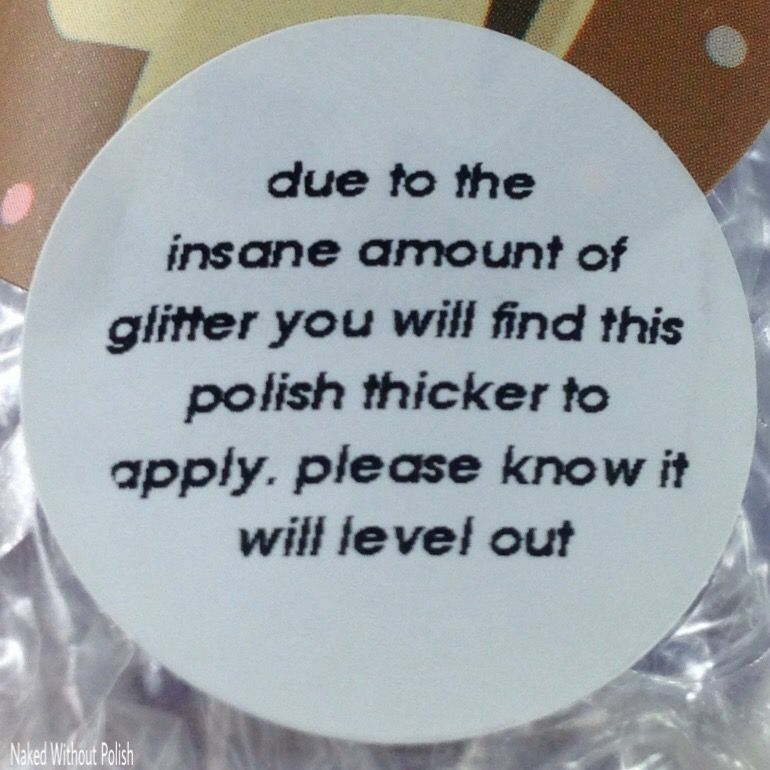 It was a little thick due to all the glitter and the temperature of my house. 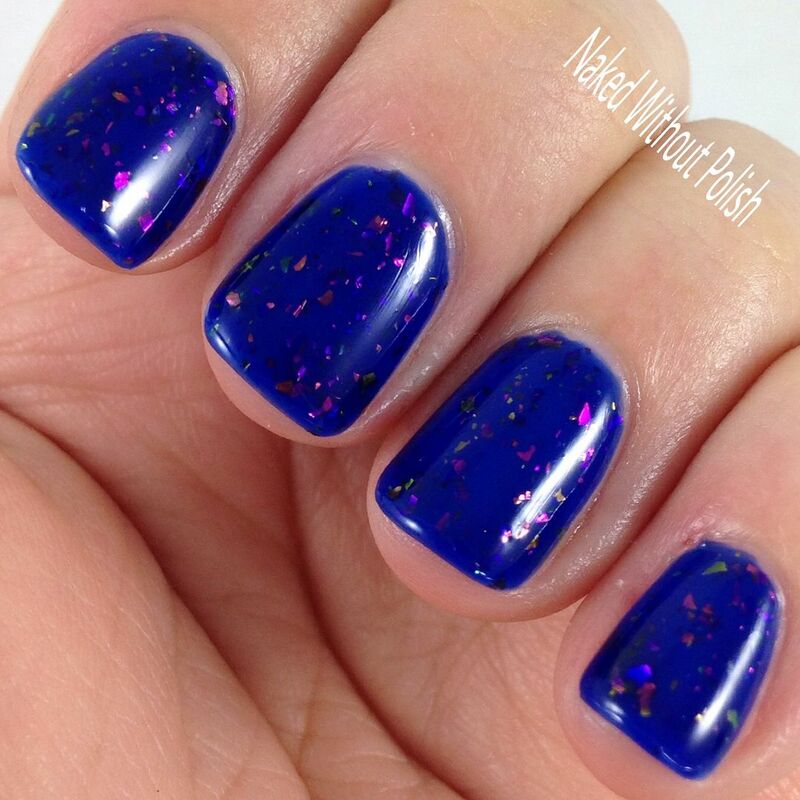 I added a little thinner and three coats later my nails were wonderfully sparkly and perfectly opaque! 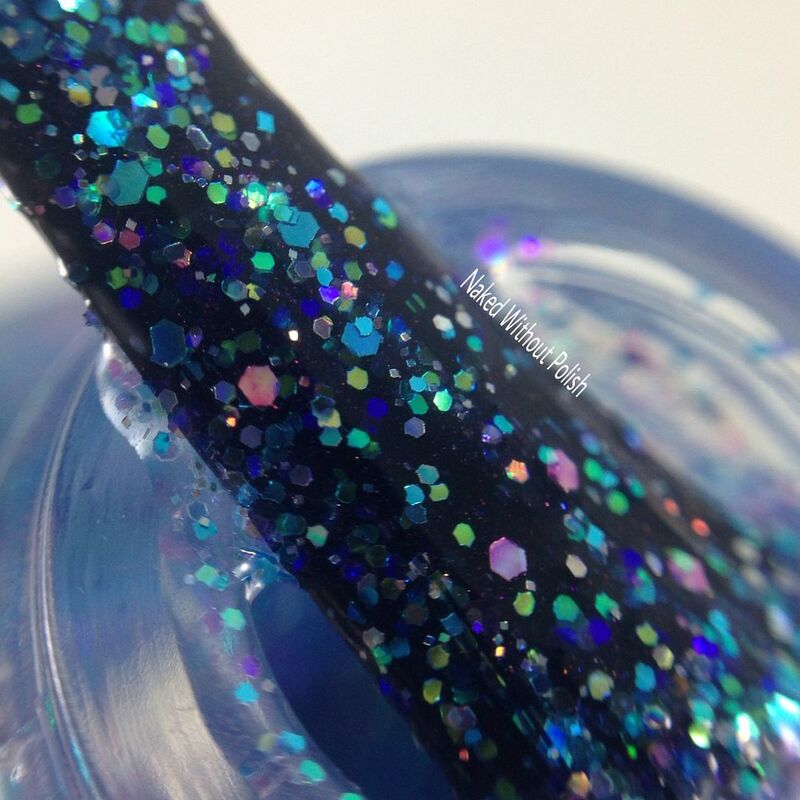 Nathan Phillips Skate is described as "a sort of dusty midnight blue with a blue flame, a dusting of holo shimmer, and holo glitters in multiple sizes, shapes, and colors". 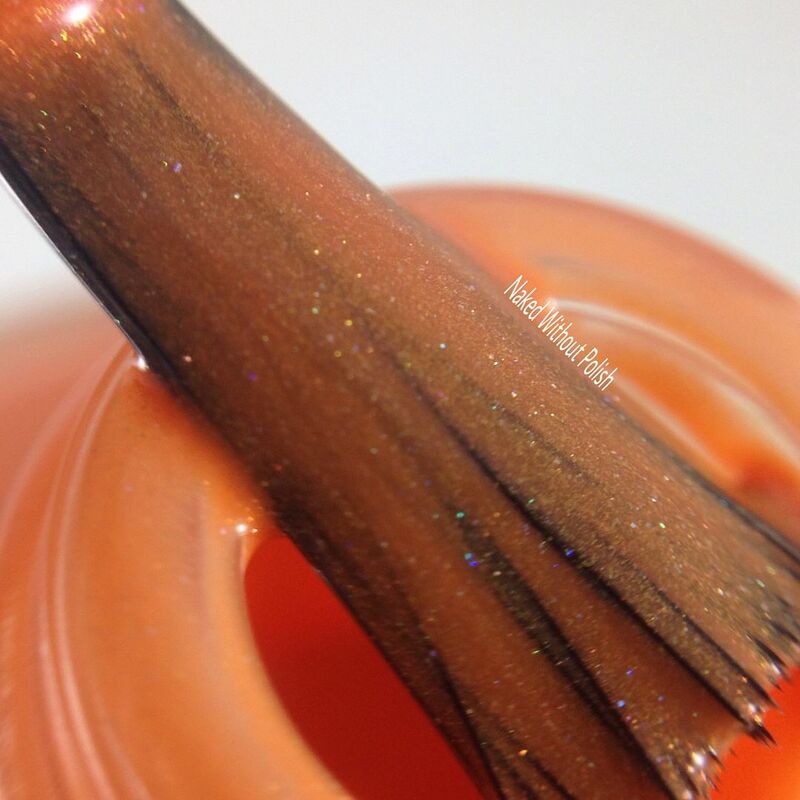 Shown is two coats of Nathan Phillips Skate with top coat. 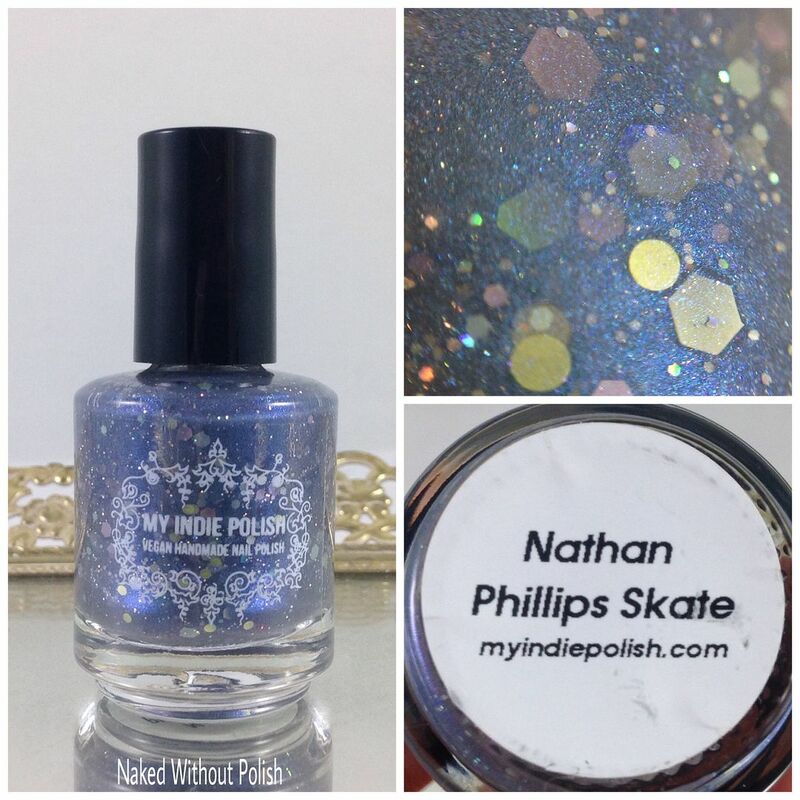 Nathan Phillips Skate is an icy, dark, mysterious polish. 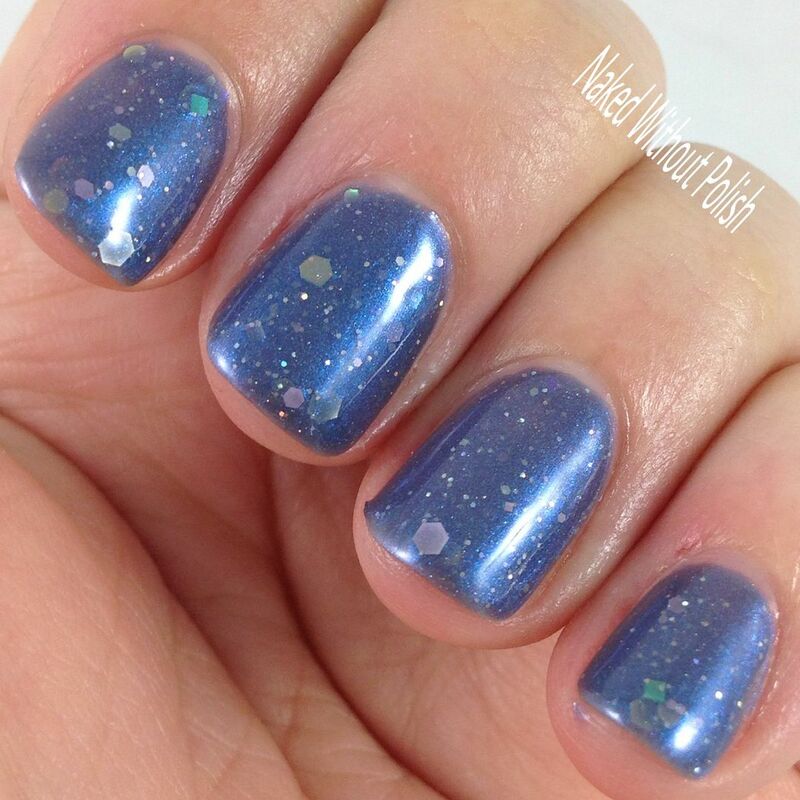 The color is a beautiful dark, mauve-y blue color filled with shimmer. 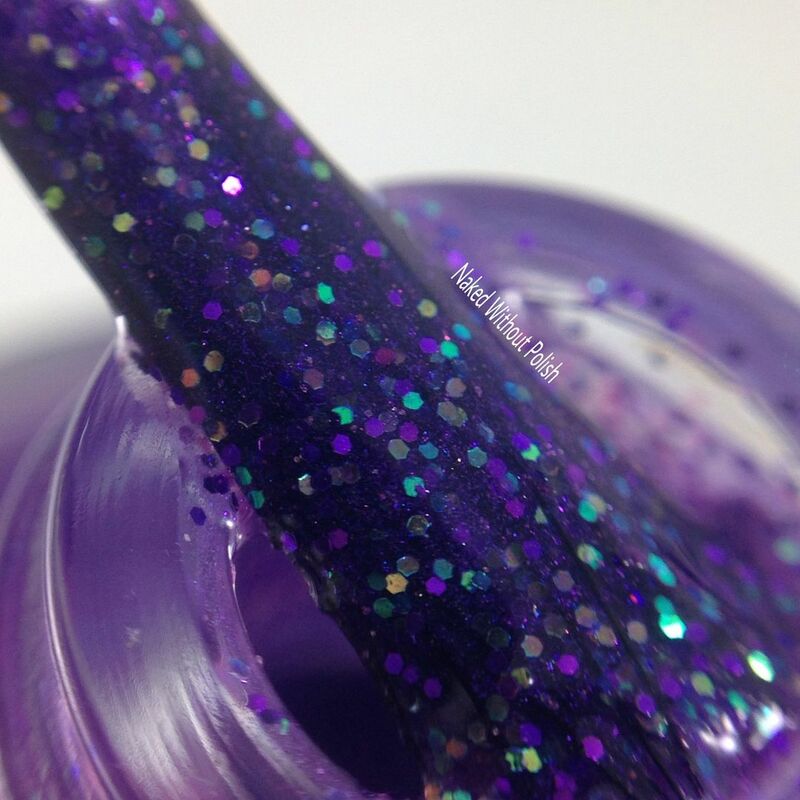 I thought this one might be a little difficult to apply due to the formula and the amount of glitter, but I was wrong! There were zero issues. 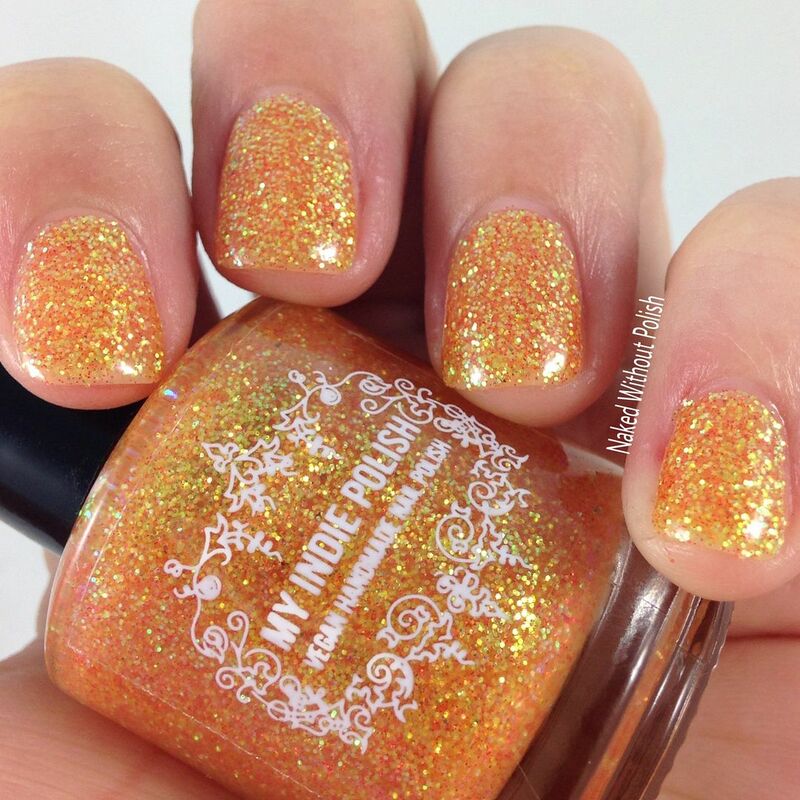 The glitter dispersed beautifully on the nail and the polish spread evenly. 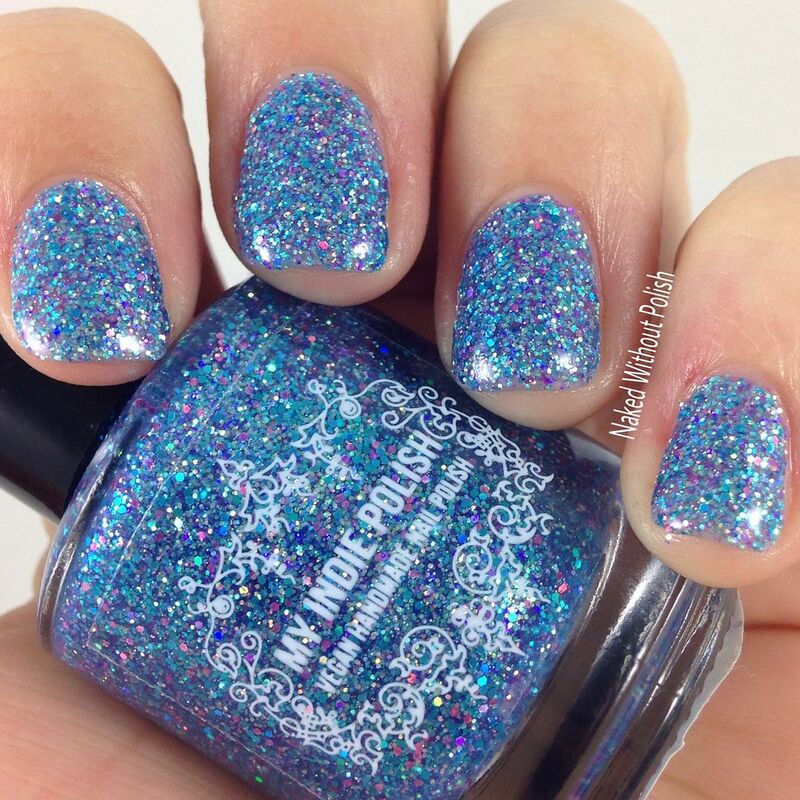 I didn't even have to fish for glitter! 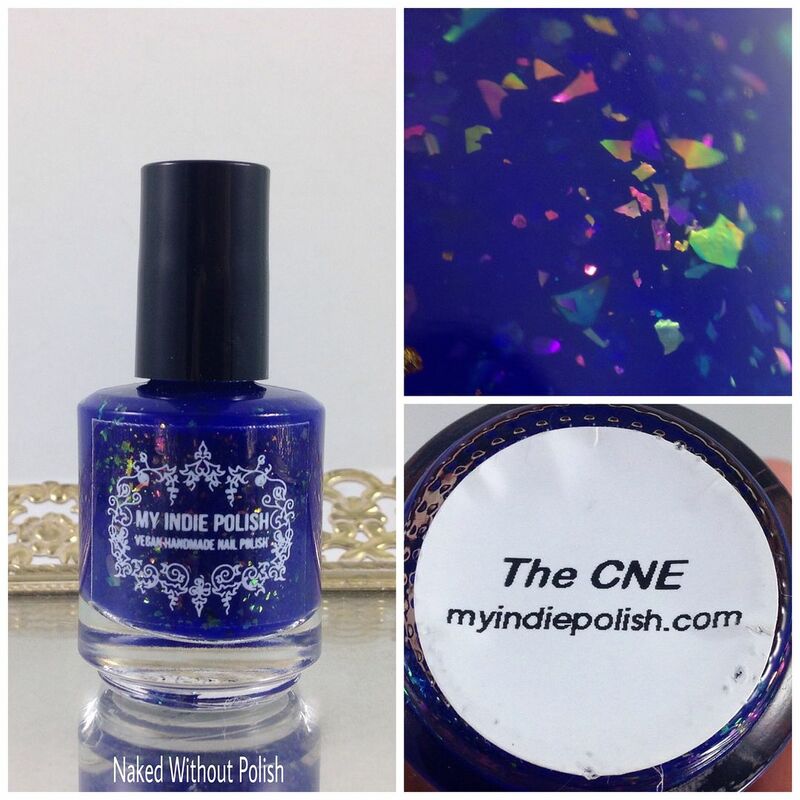 The CNE is described as "a vibrant royal blue jelly filled with UCC flakies". 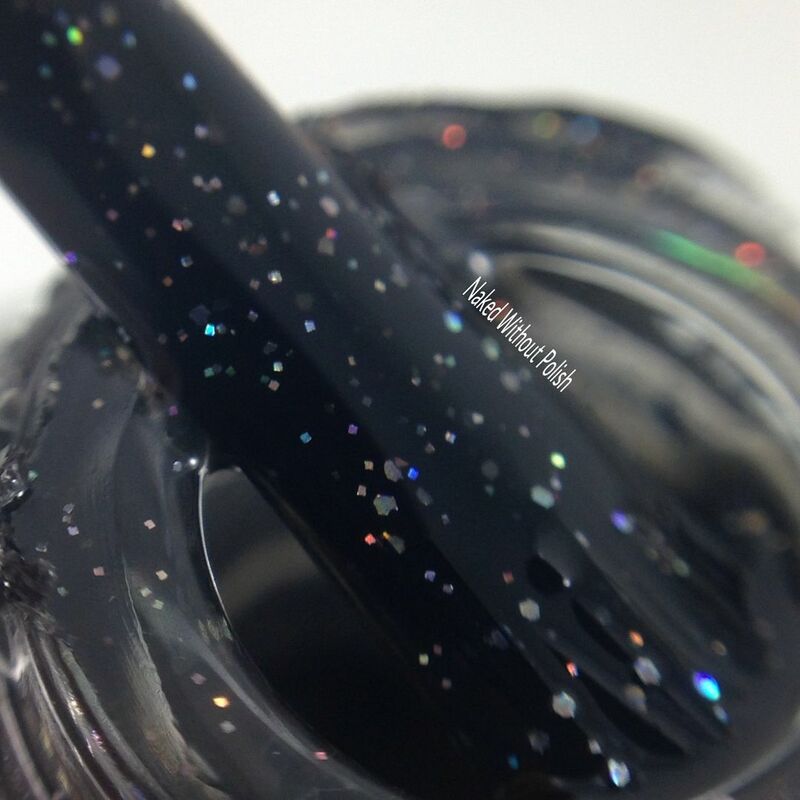 Shown is three coats of The CNE with top coat. The CNE is a stunner! Beautiful color-shifting flakes dancing in a sea of blue. If it doesn't make you smile, you have problems. It applied like a dream! 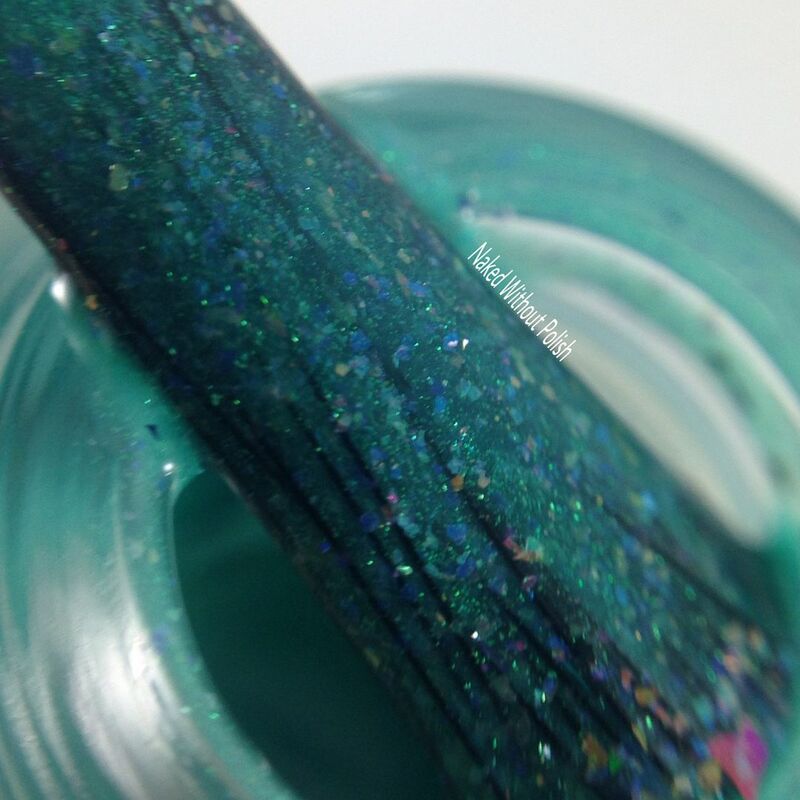 It was fully opaque after two coats, but I wanted another layer of flakies so I did a third. No regrets! 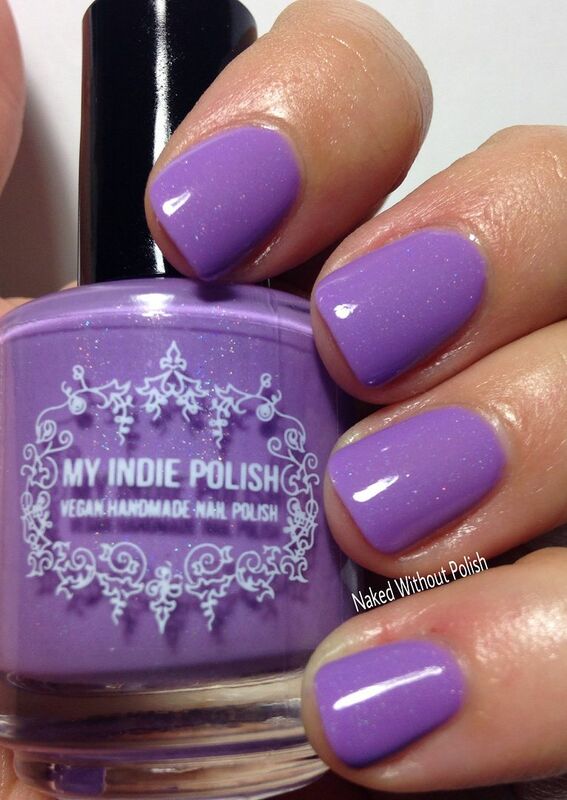 Kensington Market is described as "a playful lavender crelly with a lovely dusting of holo sparkle". 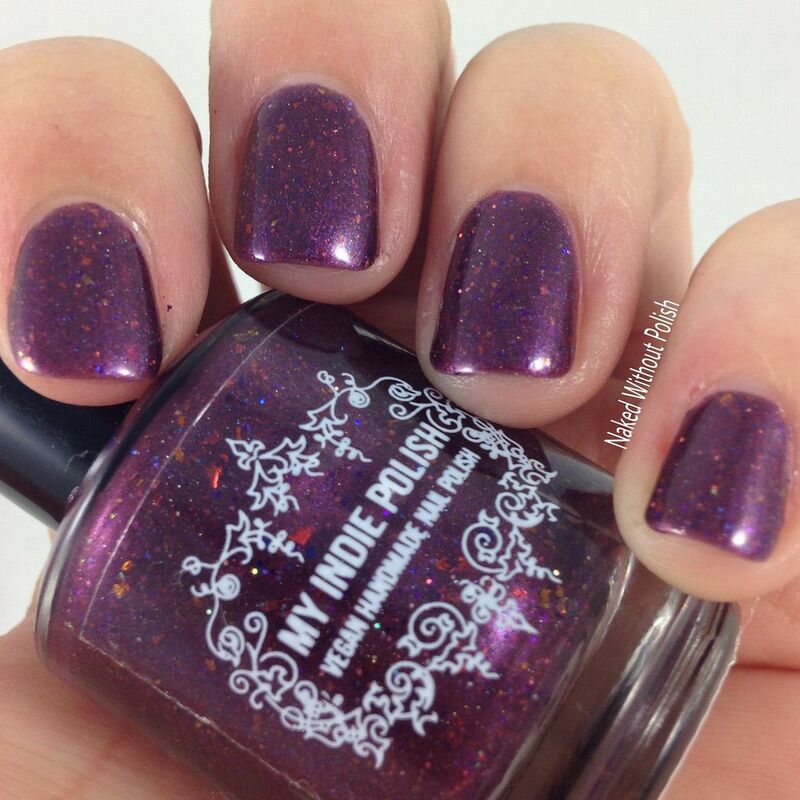 Shown is two coats of Kensington Market with top coat. 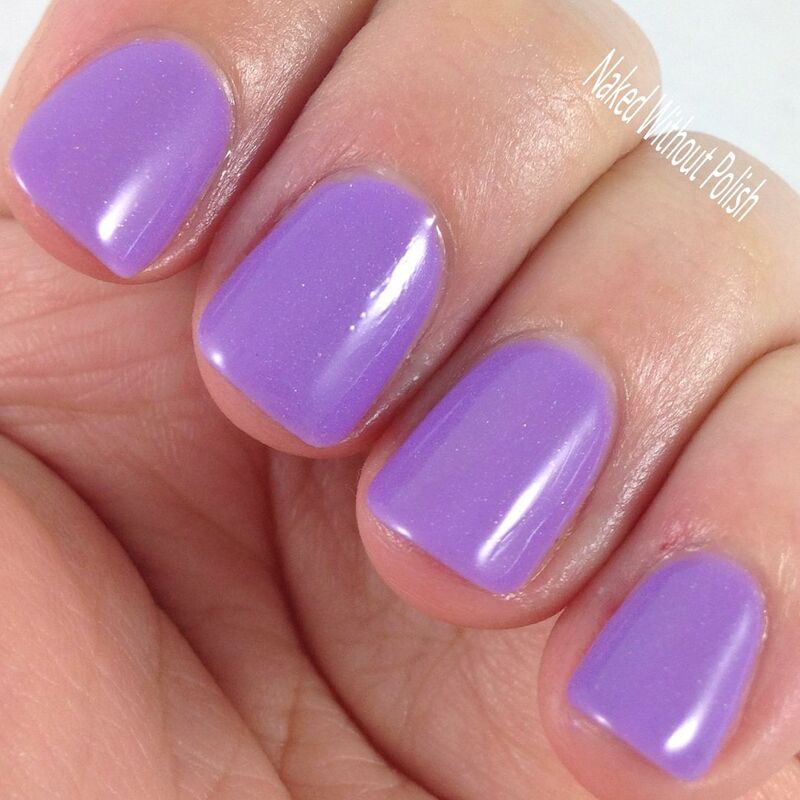 Kensington Market is the perfect purple for spring/summer. It's delicate but not super pale. It applied buttery smooth with no issues. 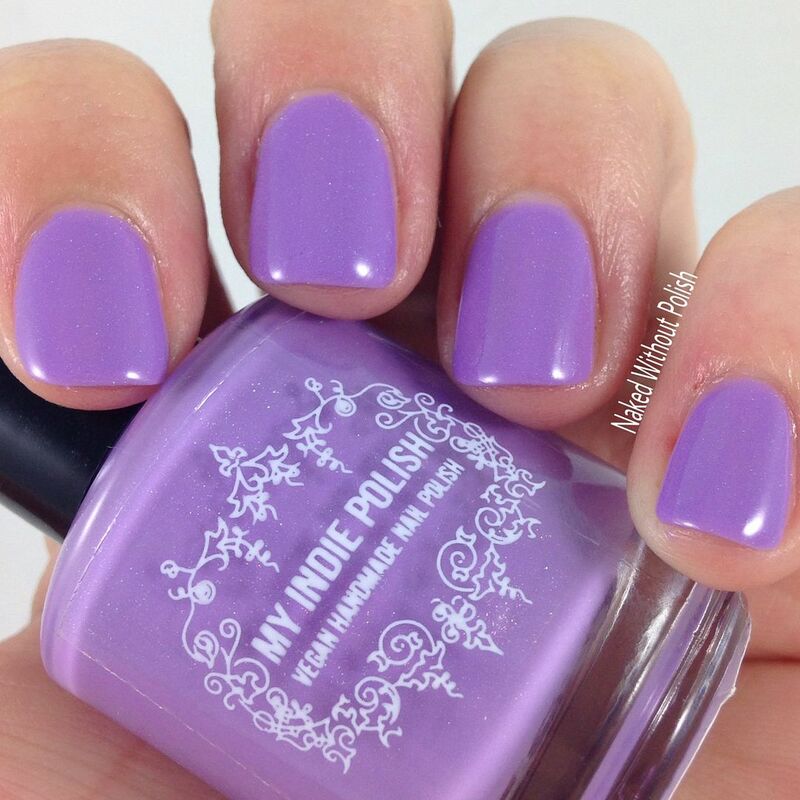 You won't need any more than two coats for a fully opaque manicure with this one. 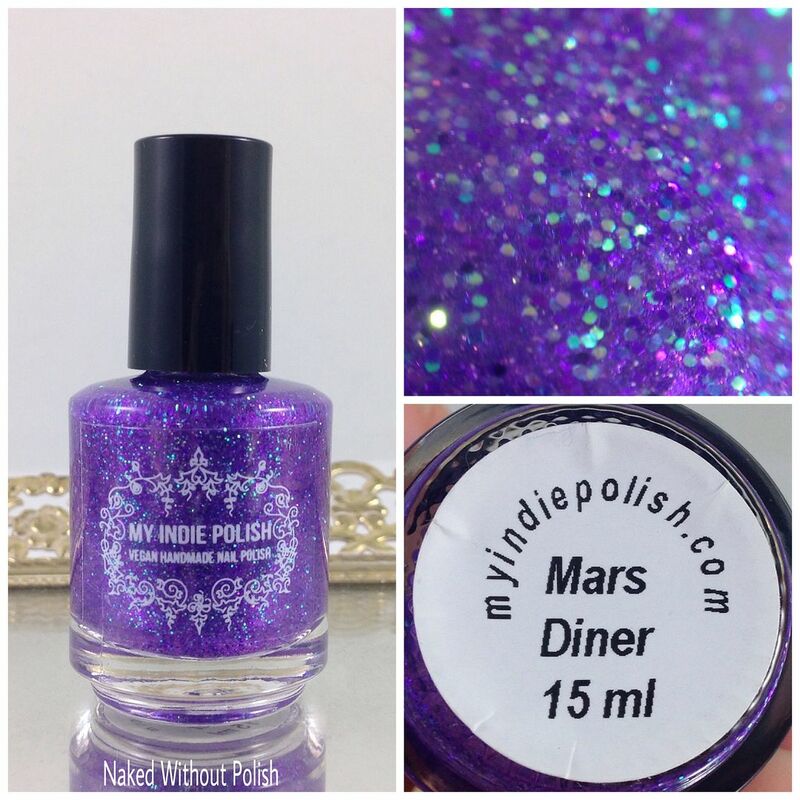 Mars Diner is described as "a purple jelly filled with purple, turquoise, and iridescent micro glitters". 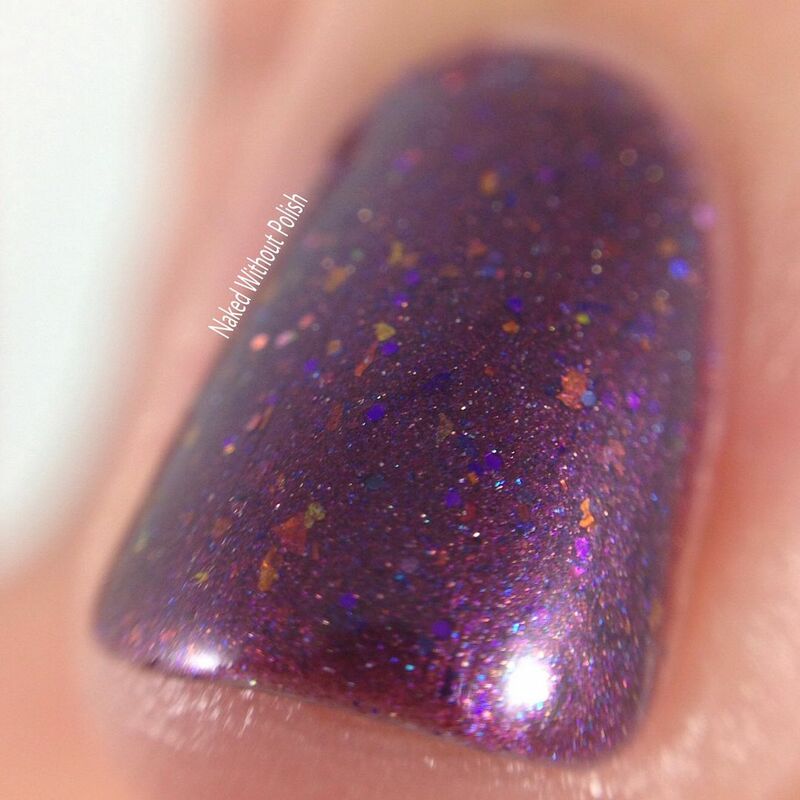 Shown is three coats of Mars Diner with top coat. Mars Diner is another one similar to Sunsets at Bluffers Park and Rouge Beach. 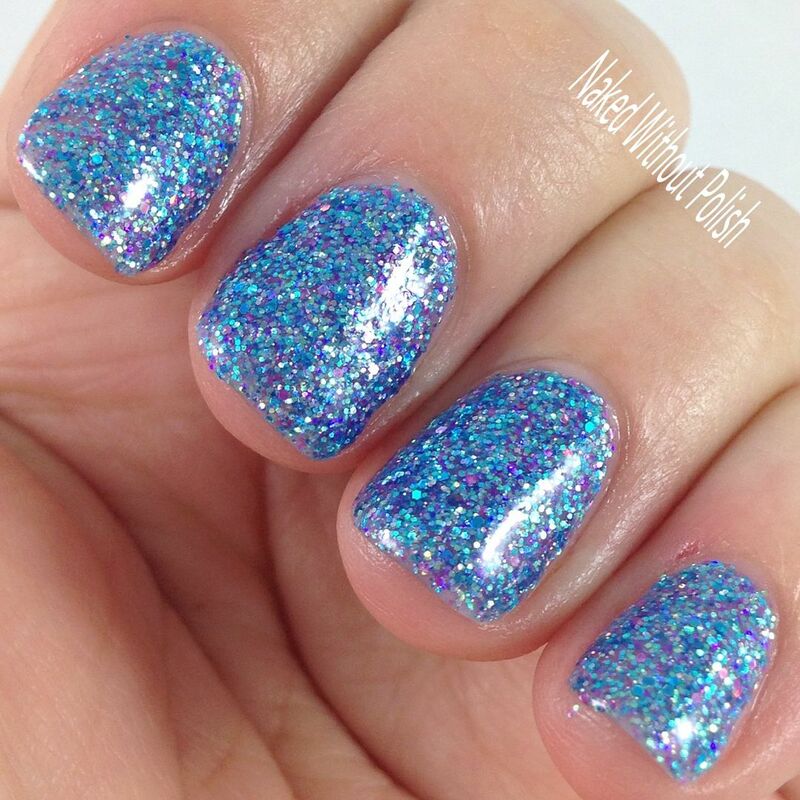 A little thick due to all the glitter, but a couple drops of thinner and three coats later, you've got a beautiful, super sparkly manicure! 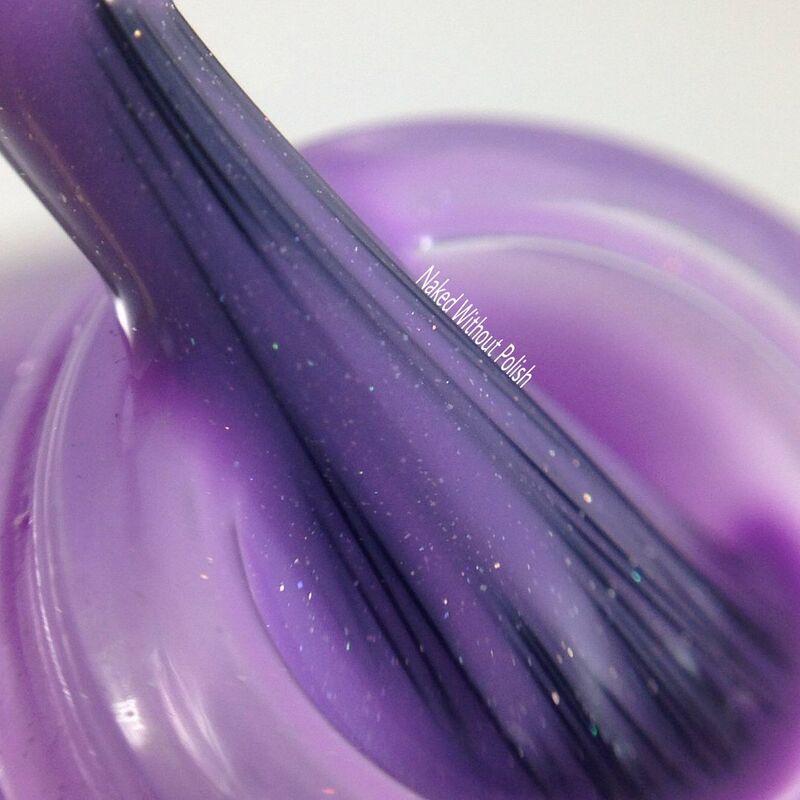 The base for this one was more of a colored jelly instead of a tinted jelly like the other two. 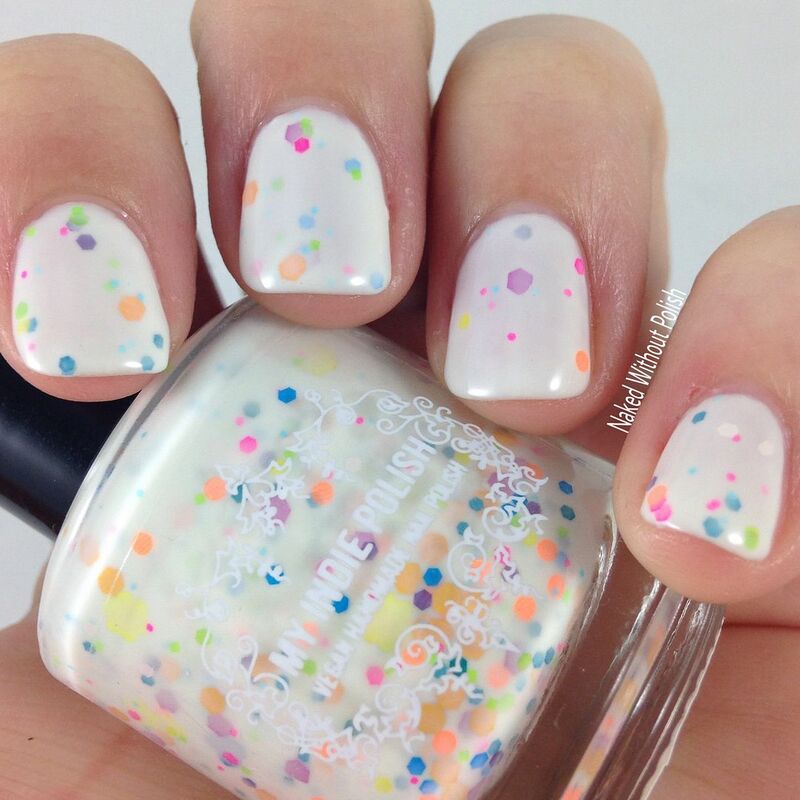 You could easily just do one coat of it over a solid base if you wanted to. 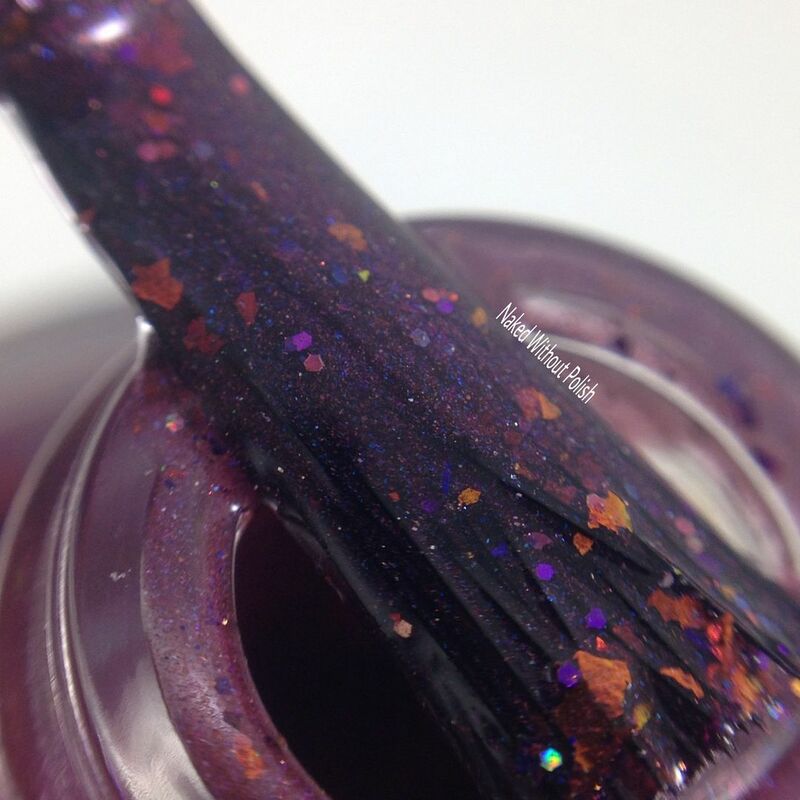 Candi is described as "a burgundy tinged plum polish filled with UCC flakies, micro glitter that plays off the colors in the flakies, and a dusting of holo sparkle". 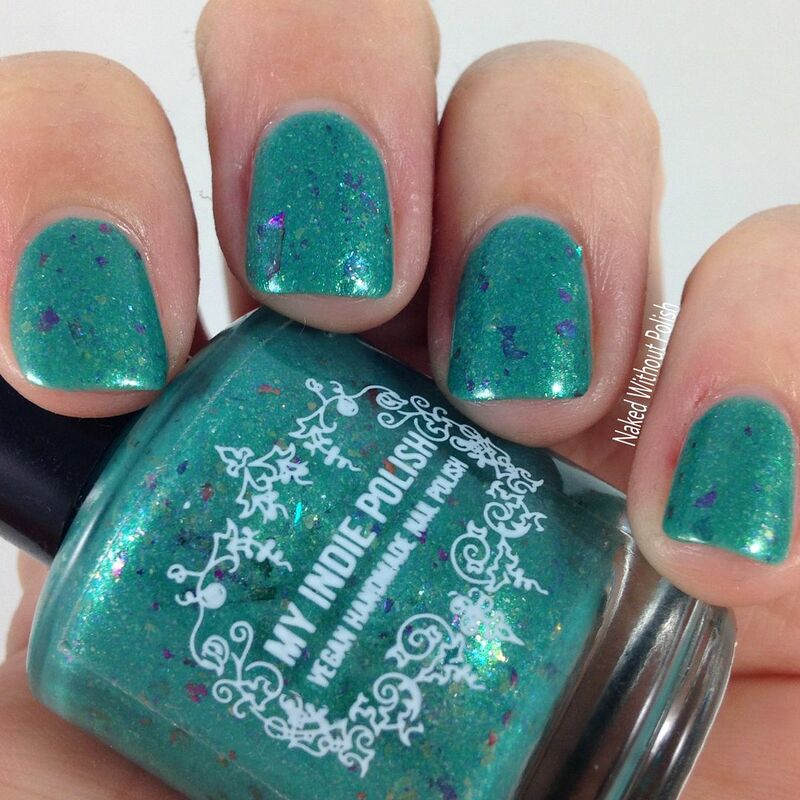 Shown is two coats of Candi with top coat. 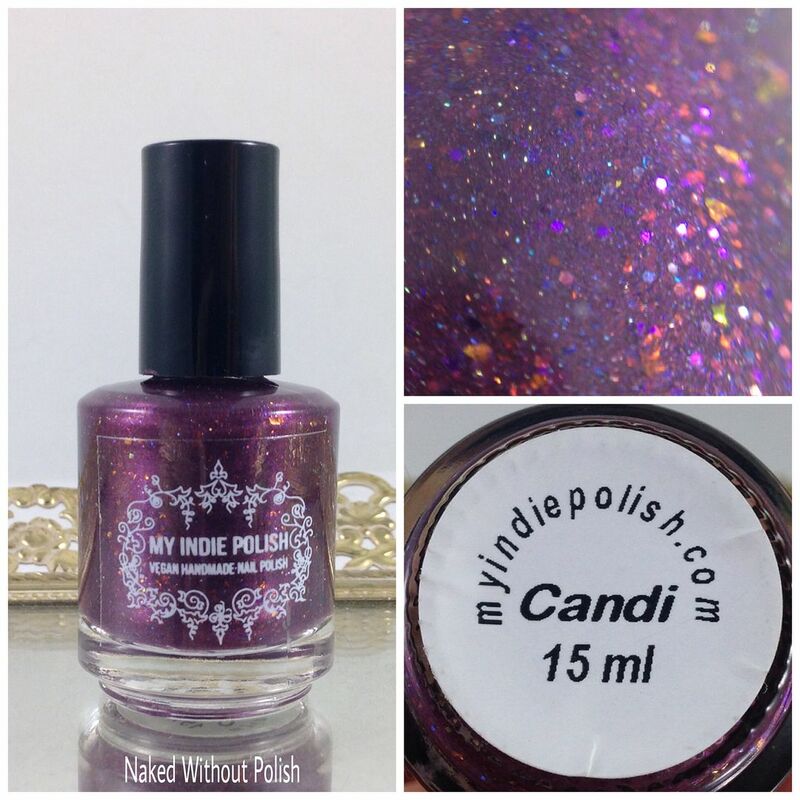 Candi is going to be my go to polish this fall. I'm already calling it! 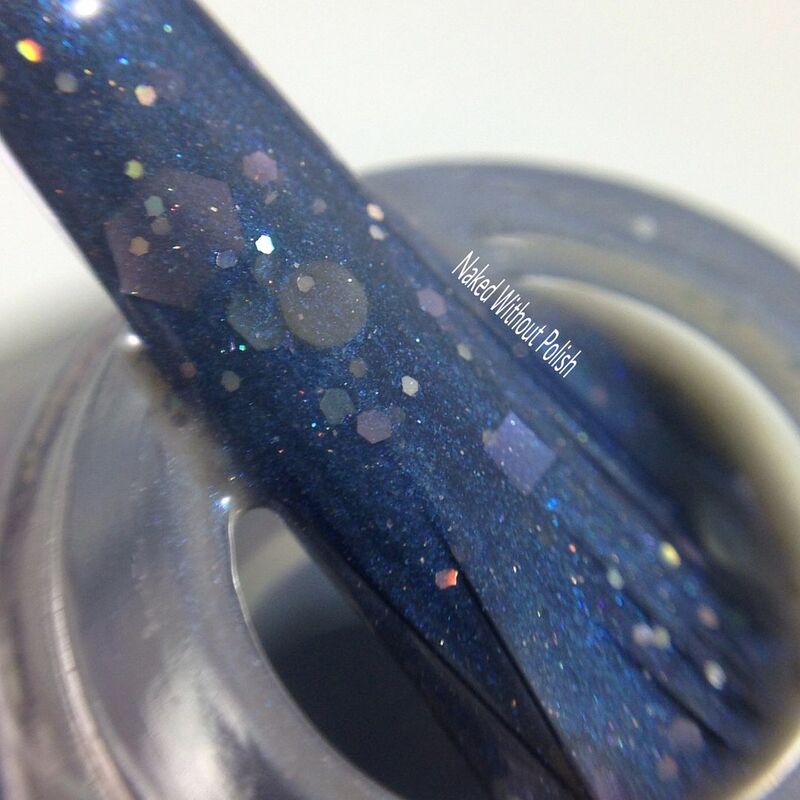 The color is rich, and the flakies are perfection. 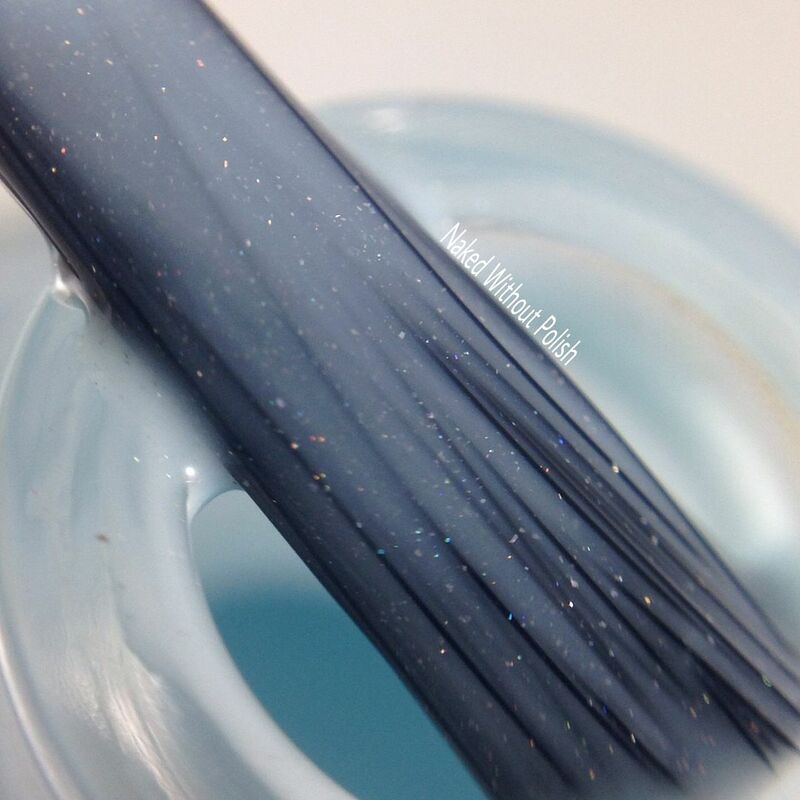 It may take two coats to reach full opacity, but you'll fall in love with this one before you're done with the first coat. 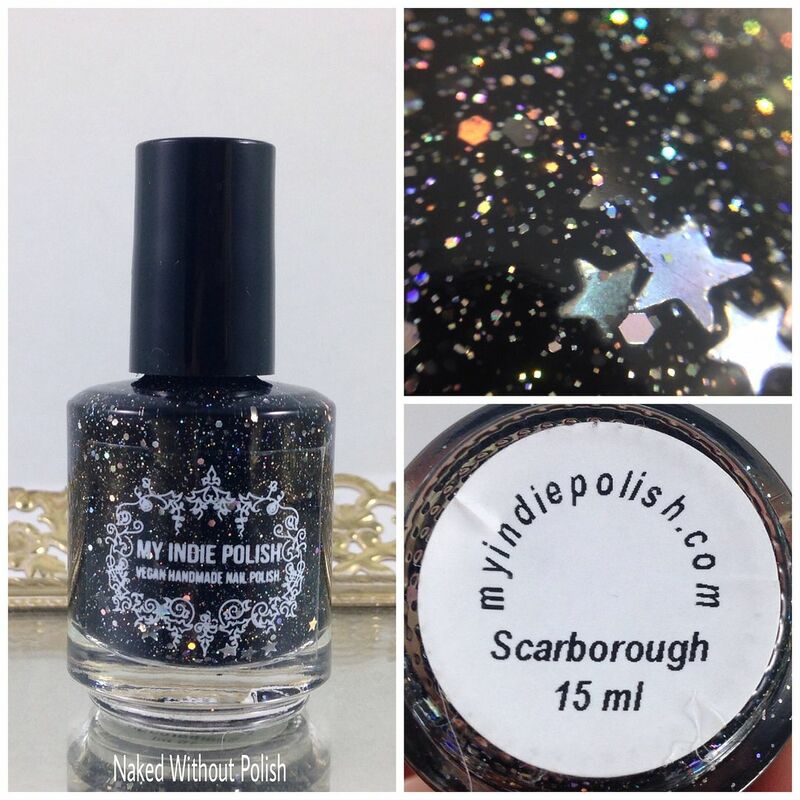 Scarborough is described as "a deep black jelly base filled with holographic sparkle, silver holo glitter in several sizes, including holographic silver stars.". Shown is two coats of Scarborough with top coat. Scarborough is one I was excited about the moment I unwrapped it. 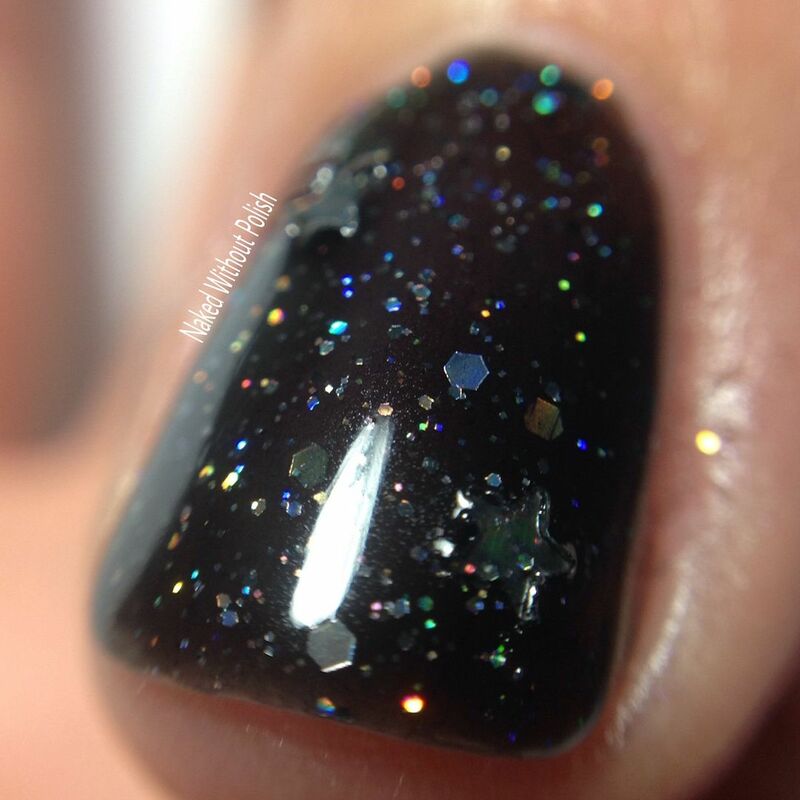 It's strange, but I really am a sucker for a black polish. I love the simplicity of this one, but it is still a lot of fun. 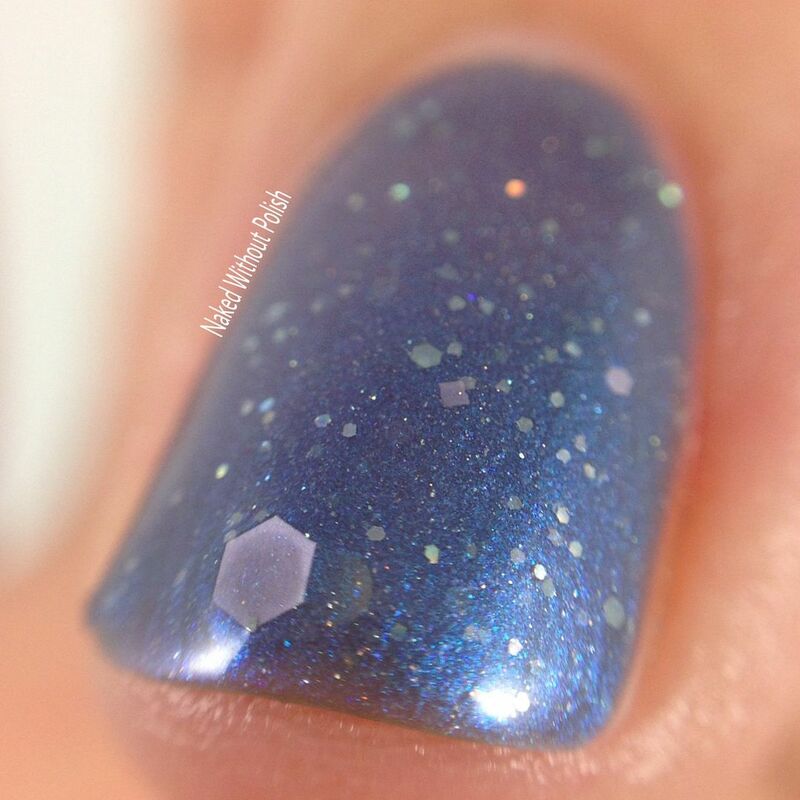 The different sizes of silver holo glitter make it look like a night sky. 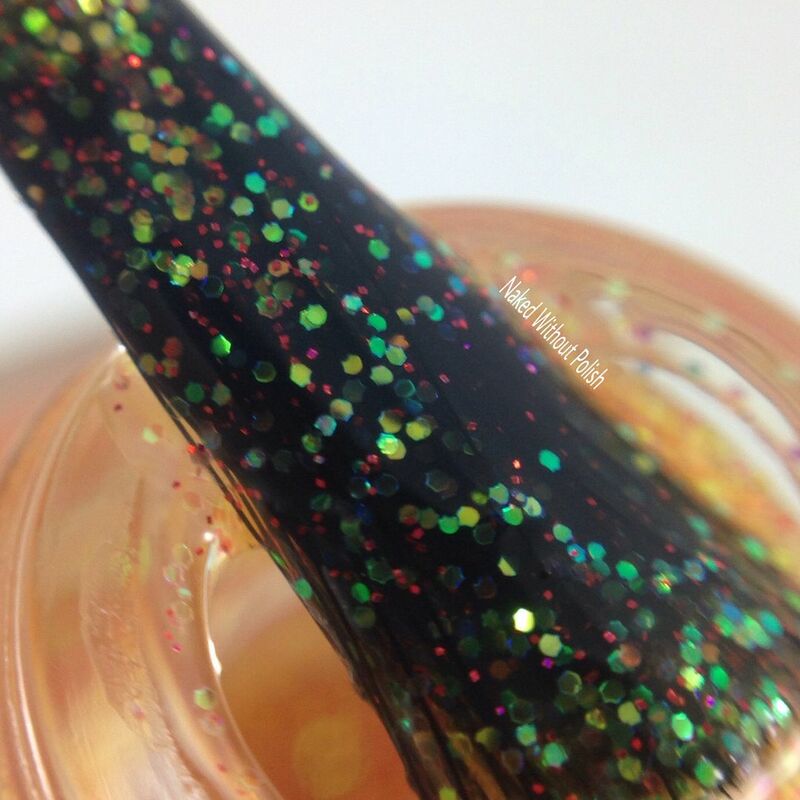 In fact, there are even some star glitter in there. 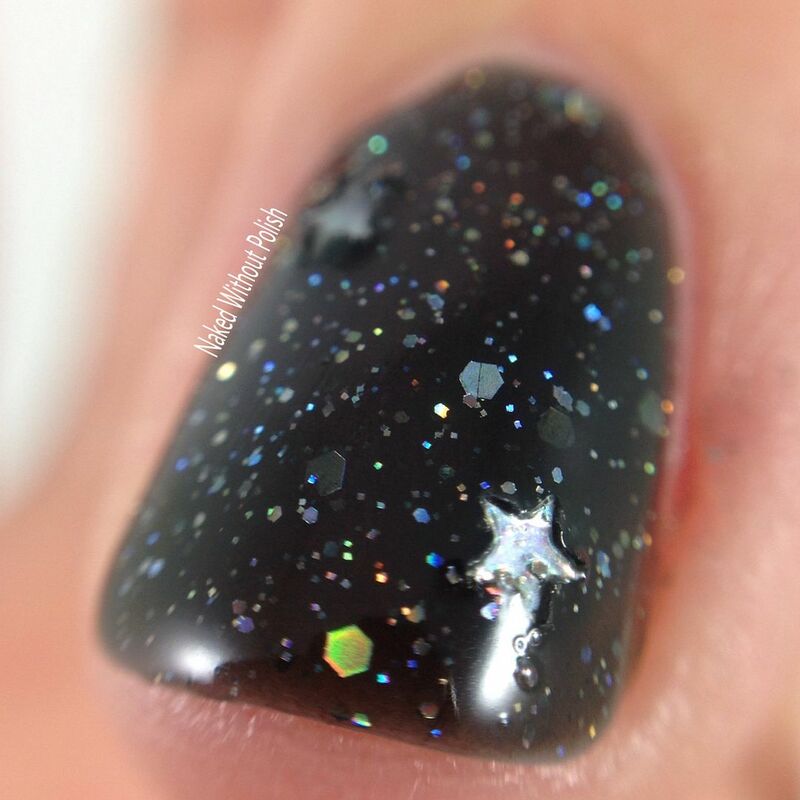 The stars were the only ones I had issues trying to get them out of the bottle. Once you get a couple out you're happy with it though. It didn't bother me. I kept it upside down for 10-15 min before using to try to get the stars to disperse, but it didn't do anything for my bottle. I used a toothpick and was able to get a few out. 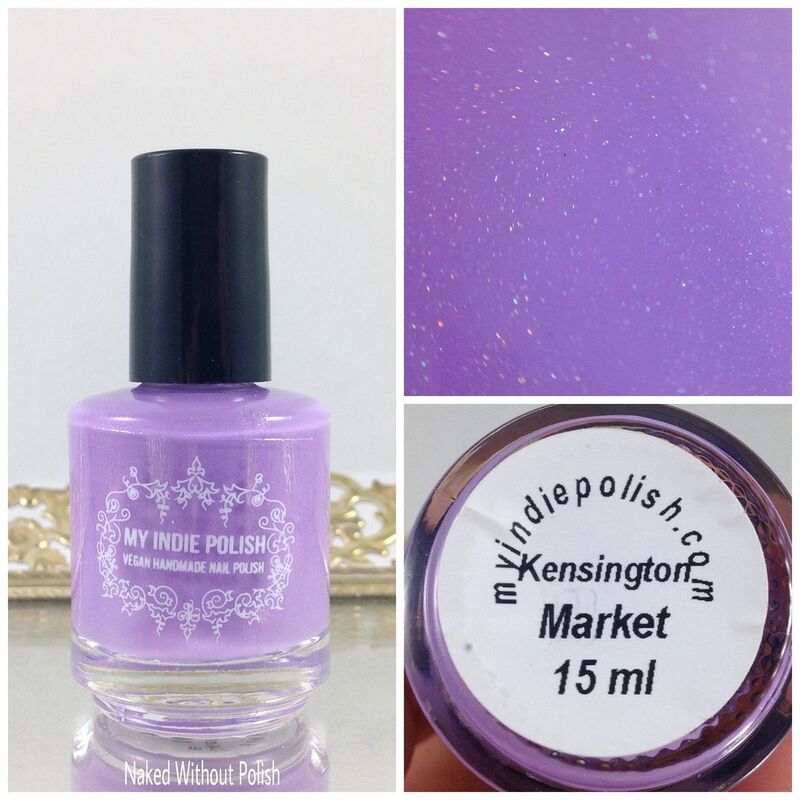 The Hello Toronto Collection is available to purchase now at http://myindiepolish.com. You can purchase the entire collection for $100 in mini sized bottles or $150 in full sized bottles. 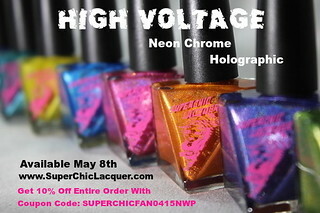 Each polish is also available to purchase individually for $8.75 in mini sized bottles or $14 in full sized bottles. Remember that all prices are in CAD and not USD. 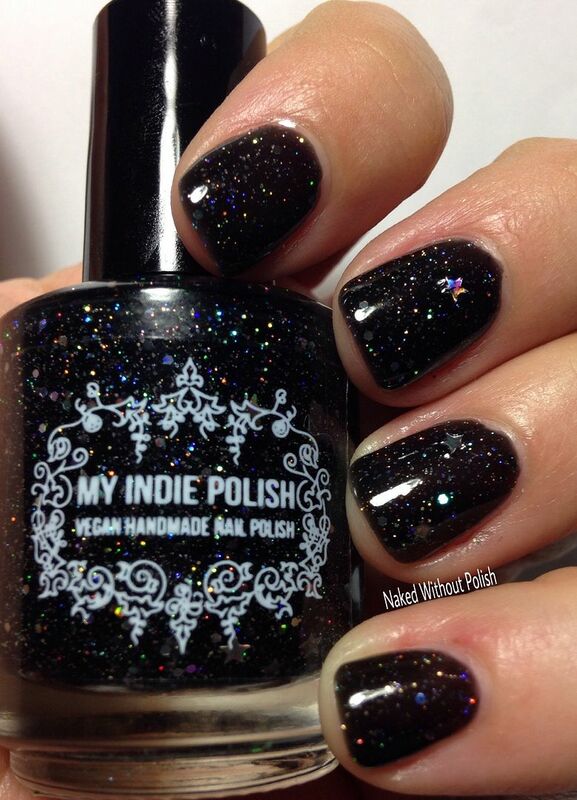 Make sure you are following My Indie Polish on all her social media platforms (links below) to stay updated on news, releases, and sales. She did such a beautiful job with each of these. 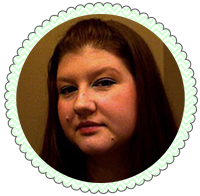 I loved reading about each of the inspirations in the listings. 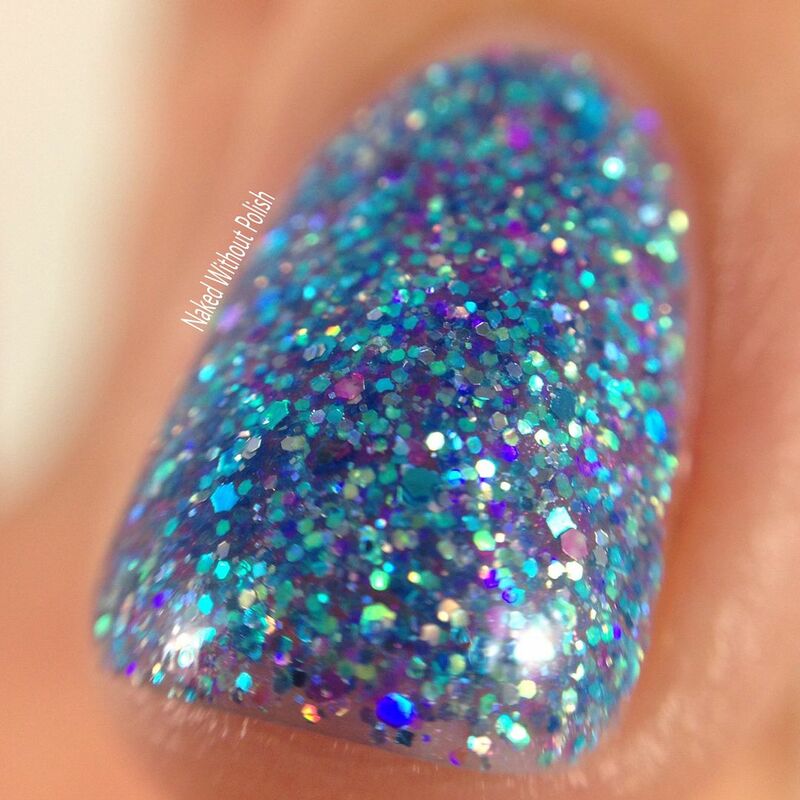 Which from the Hello Toronto Collection are stand outs to you? Did you snag any of them already?